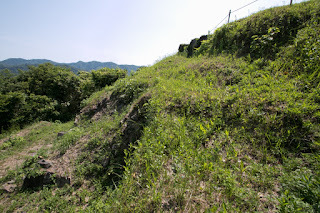 Sashiki castle (佐敷城) is located at Shiroyama hill, one of 90 meter high from hillside at the center of Sashiki area of Ashikita town. 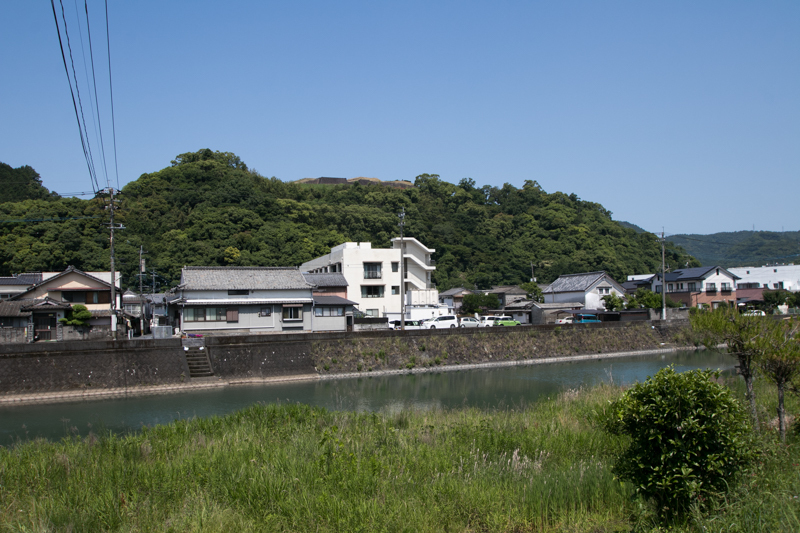 Sashiki area places at the mouth of Sashikigawa river, and at the middle of Yatsushiro city and Minamata city. 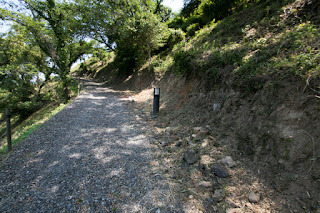 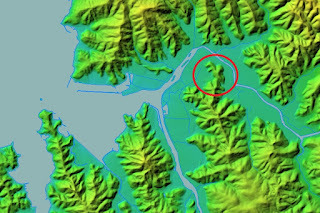 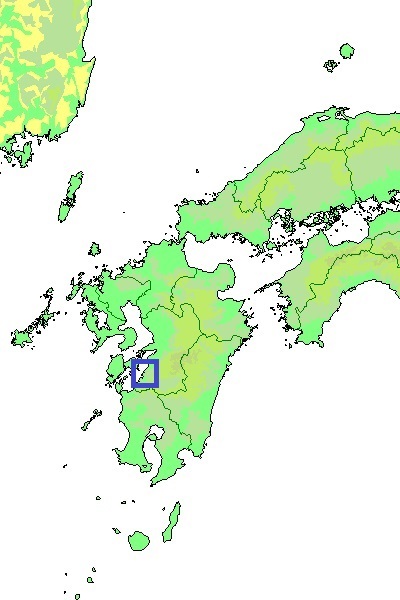 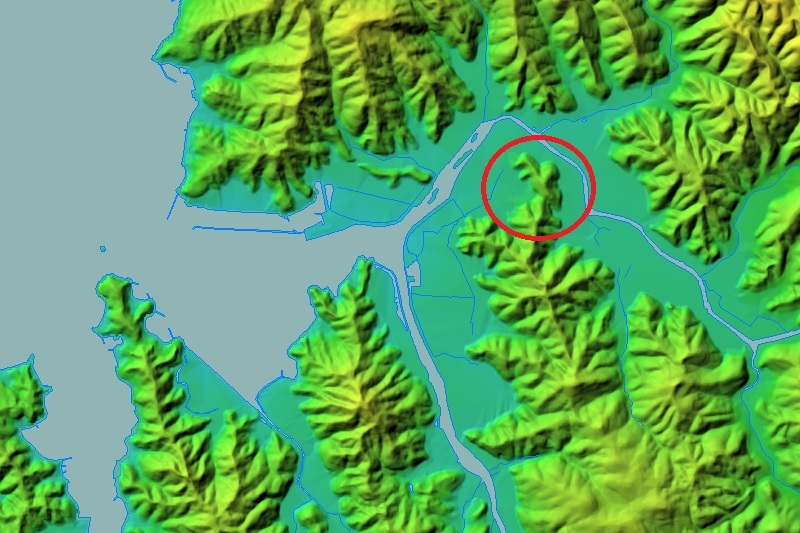 Sashiki area was a connecting point of the road from Kumamoto area to Kagoshima area along the coast of Amakusa sea, inland road toward Hitoyoshi basin and sea route toward Amakusa islands. Sashiki port is also a good port used from medieval era, and arrival of Western ship in 1597 is recorded. Sashiki castle was originally built by local lord Sashiki clan in 14th century, but in the former half of 16th century Sagara clan at Hitoyoshi castle expanded their territory to this area and seized Sashiki castle. 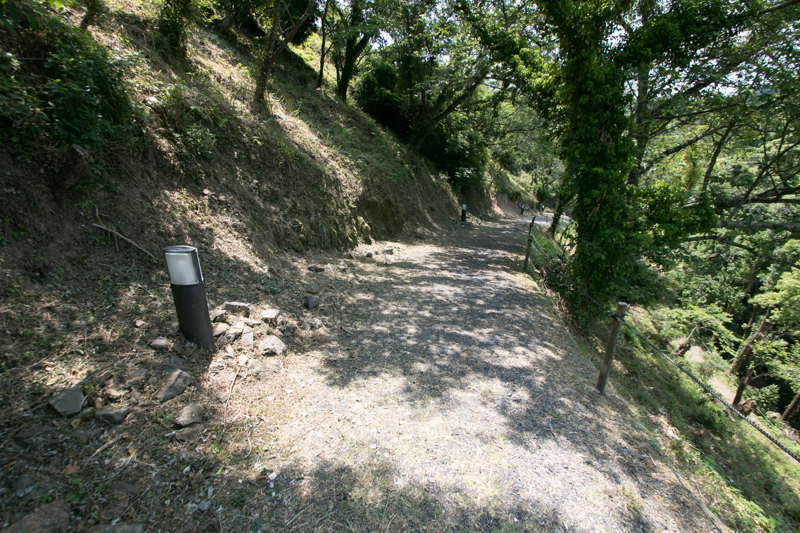 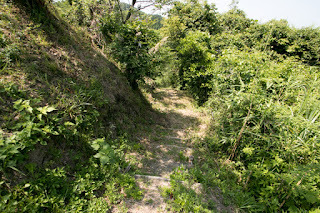 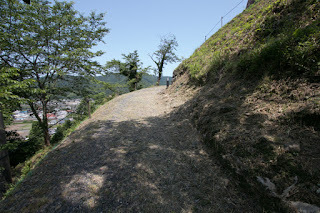 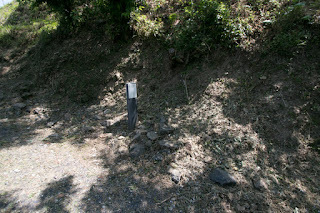 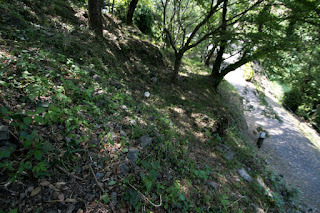 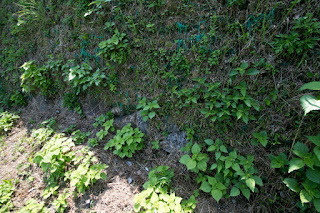 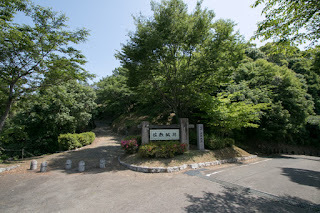 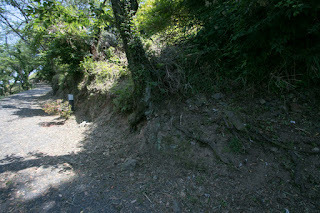 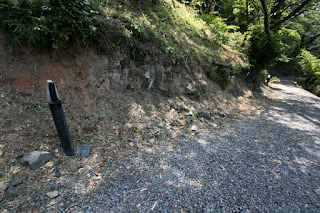 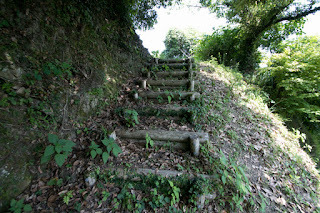 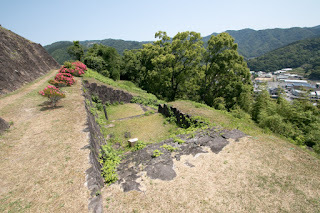 But since 1550's Shimazu clan which was the governor of Satsuma province (Kagoshima prefecture) which settled their internal conflict started expansion toward north, and in spite of desperate defense of Sagara clan, Shimazu clan finally fell Minamata castle in 1581 and Sagara clan lost Sashiki castle along with Minamata castle. Shimazu clan kept expansion and captured most part of Kyushu region. 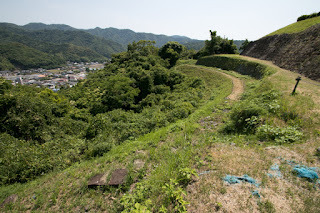 But in 1587 central ruler Hideyoshi Toyotomi (1537-1598) lead 200,000 soldiers and made expedition against Shimazu clan, and significantly outnumbered Shimazu clan surrendered to Hideyoshi in two month. Higo province except for Hitoyoshi area was given to Narimasa Sassa (1536-1588), but strict land survey by Narimasa evoked large rebellion of local lords and Narimasa was forced to die for the blame of this failure. 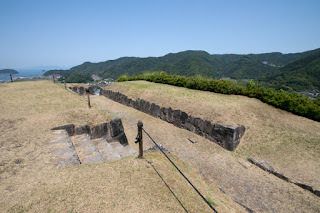 After Narimasa, Hideyoshi placed his distant relative and confident general Kiyomasa Kato (1562-1611) as a lord of north half of the province, and also Yukinaga Konishi (1555-1600) who was good at both of tactic and commerce as a lord of south half. But Sashiki area which directly controlled local communication and faced Shimazu clan was given to Kiyomasa, who was known for his braveness. 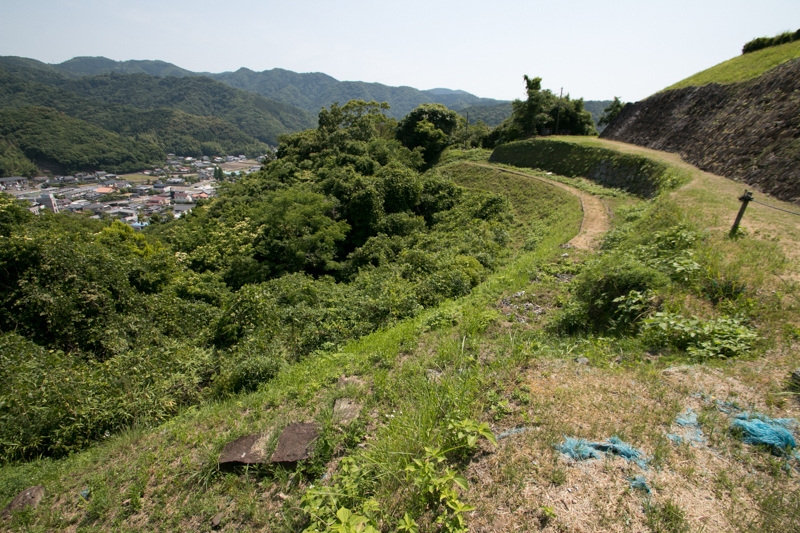 Fear for the battle with Shimazu clan at Sashiki area soon realized. 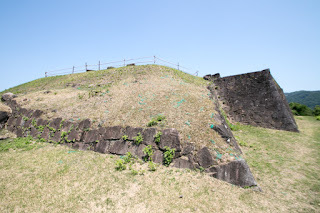 In 1592, on the way to foreign expedition, Kunikane Umekita (?-1592) who was the navy commander of Shimazu clan and waited for departure at Sashiki port suddenly made a rebellion against Toyotomi government, utilizing the absence of castle commander. 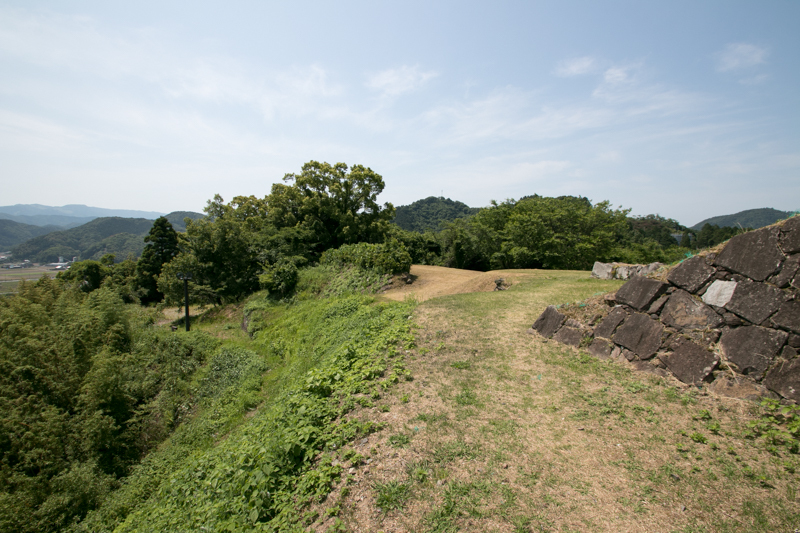 The reason of rebellion is said as an antipathy for centralization or mobilization to foreign country by Hideyoshi. 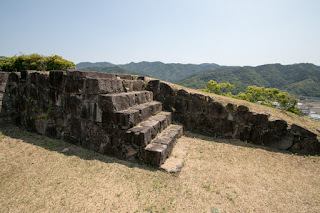 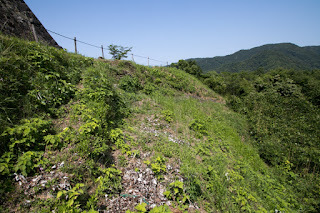 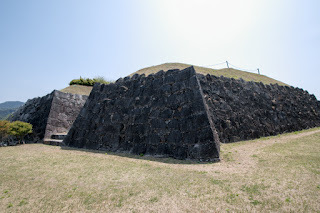 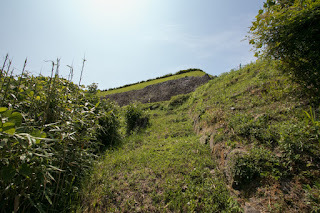 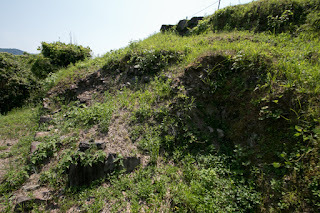 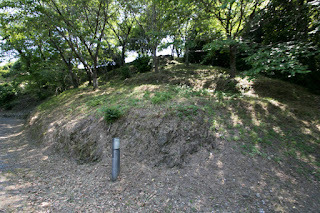 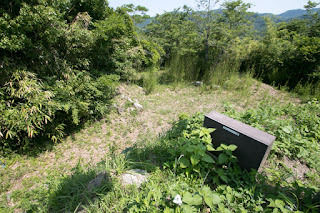 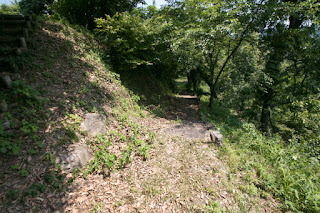 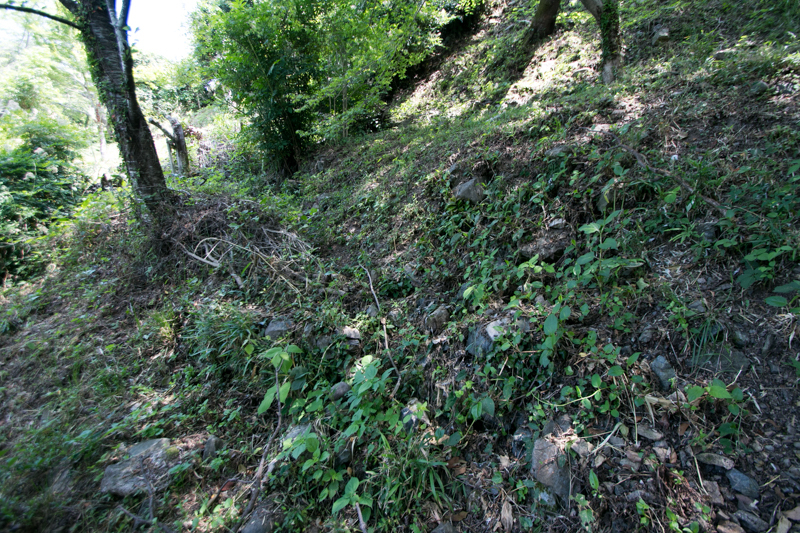 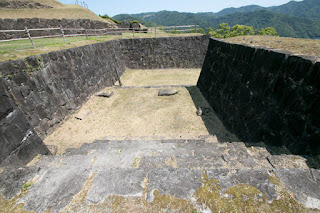 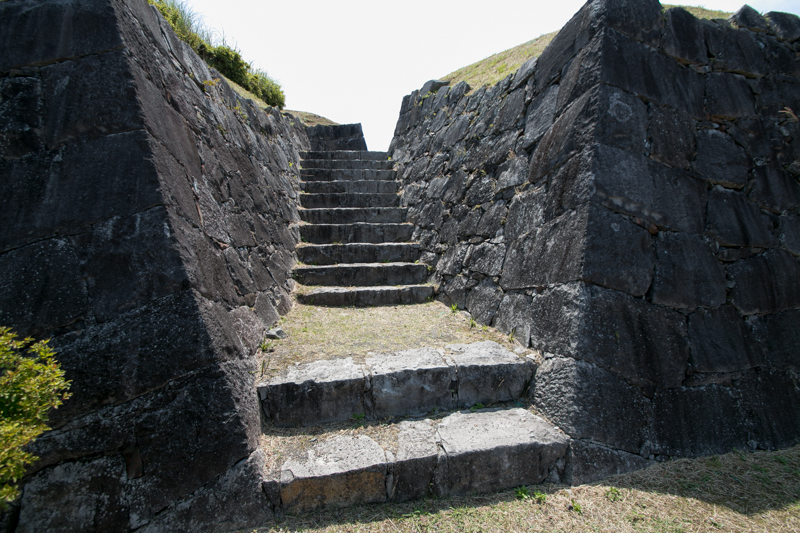 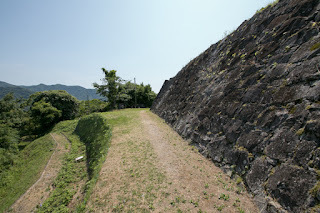 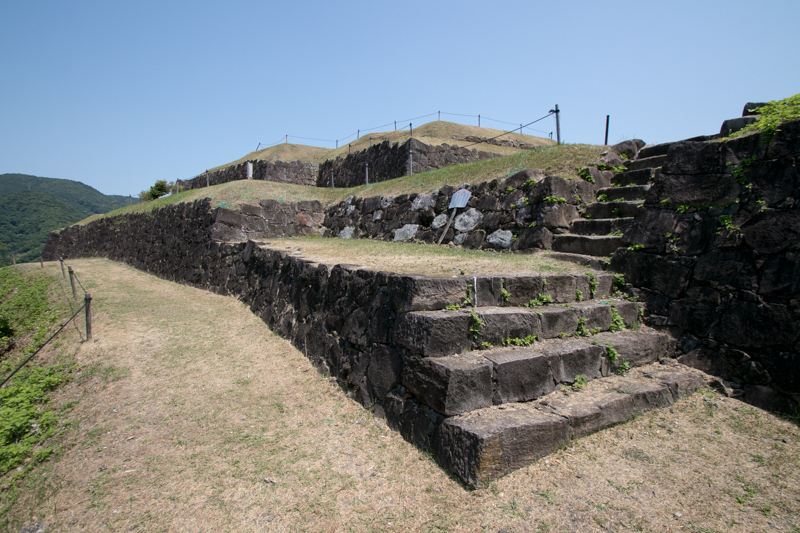 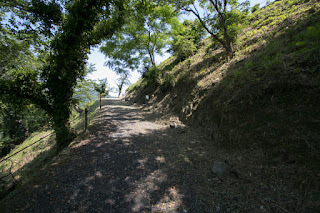 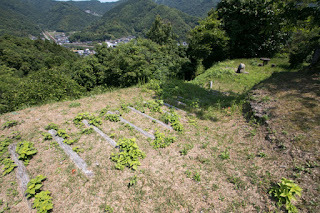 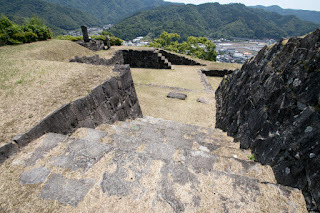 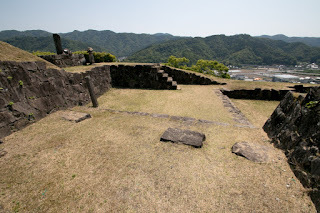 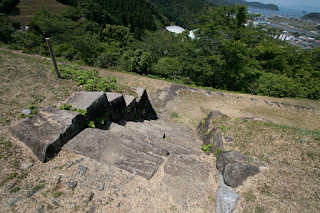 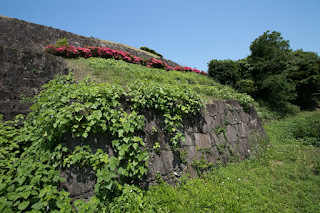 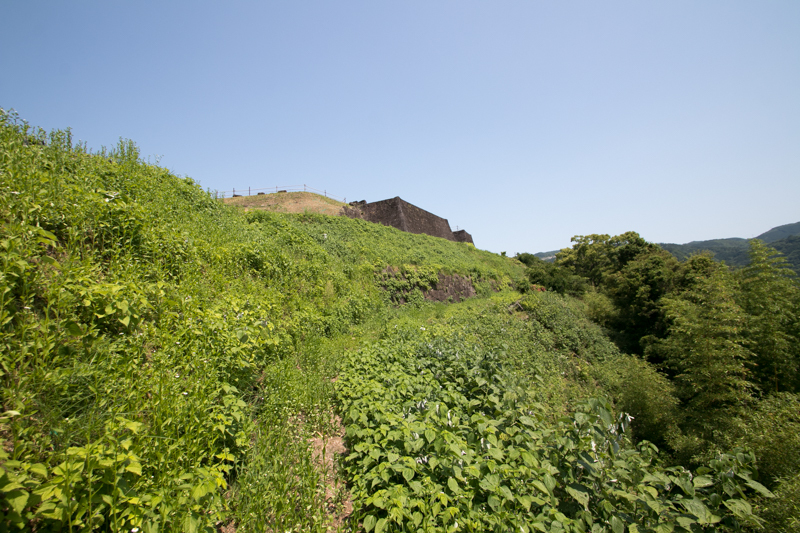 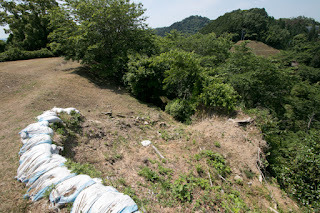 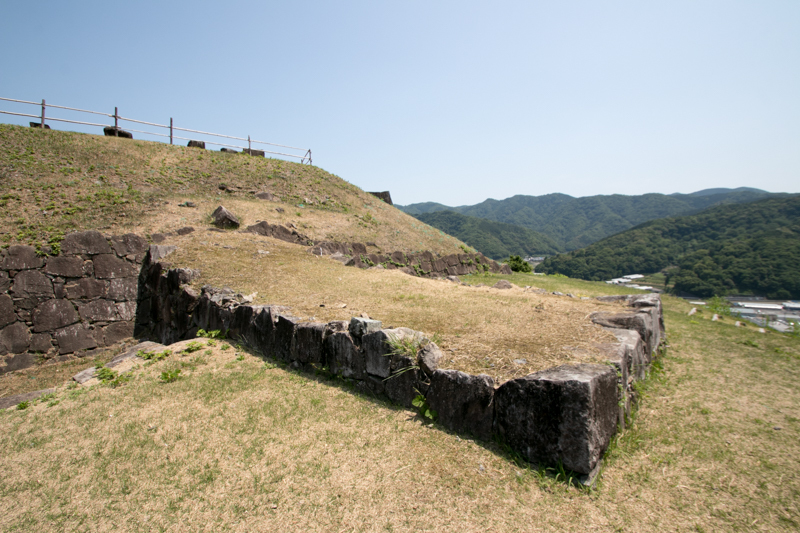 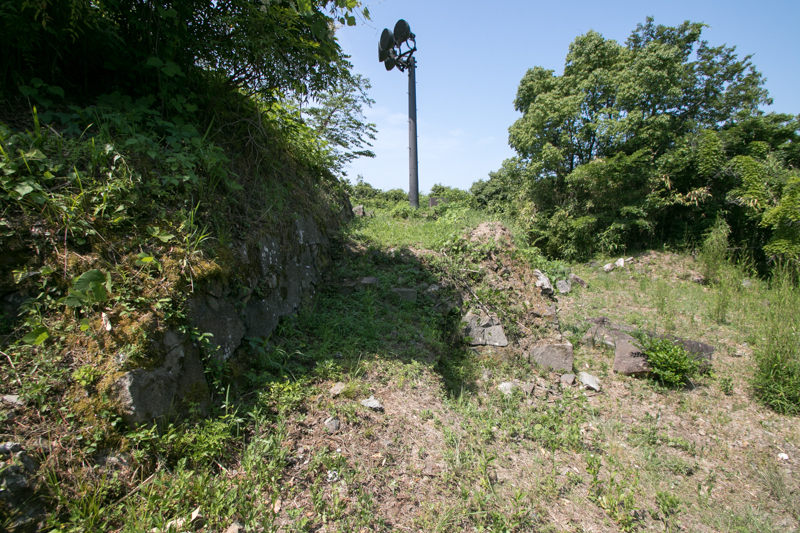 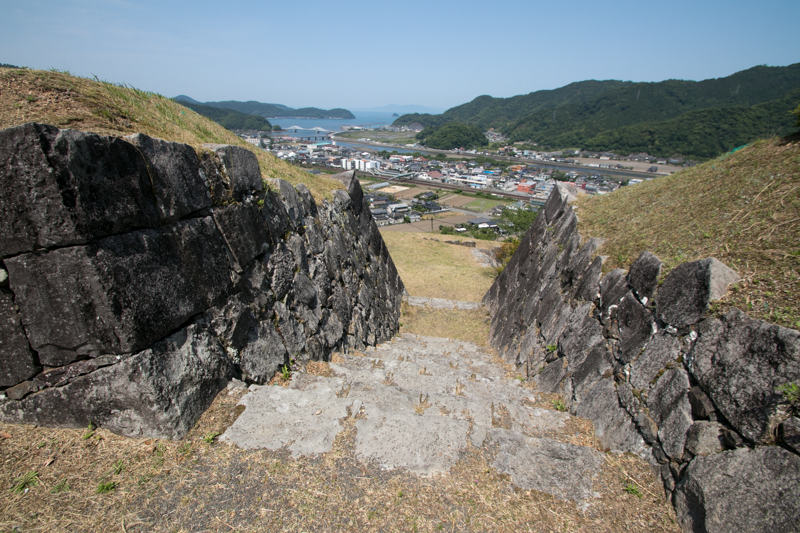 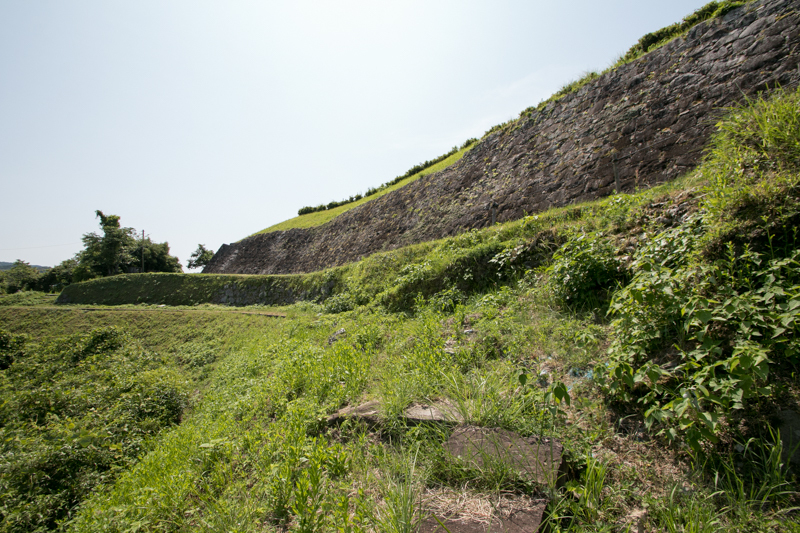 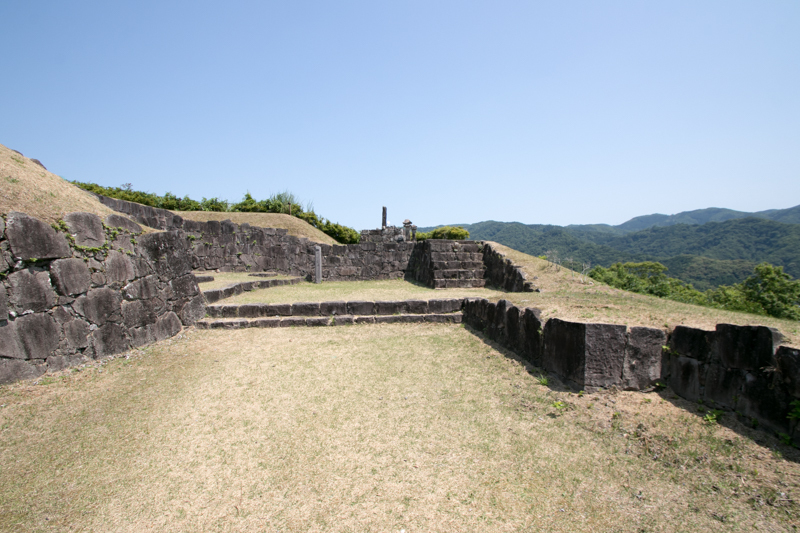 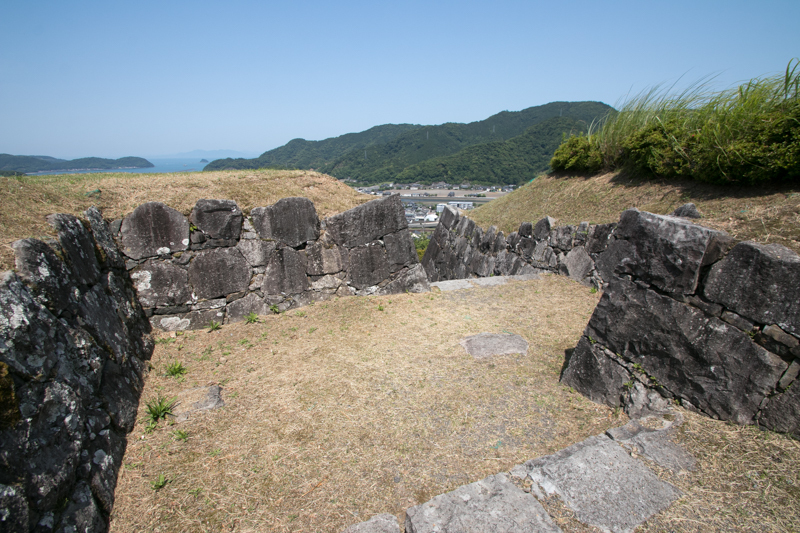 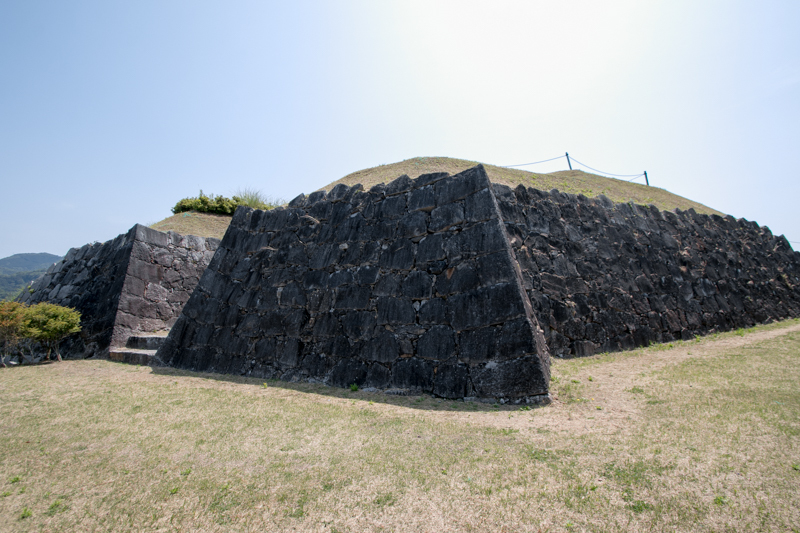 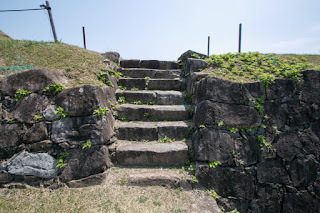 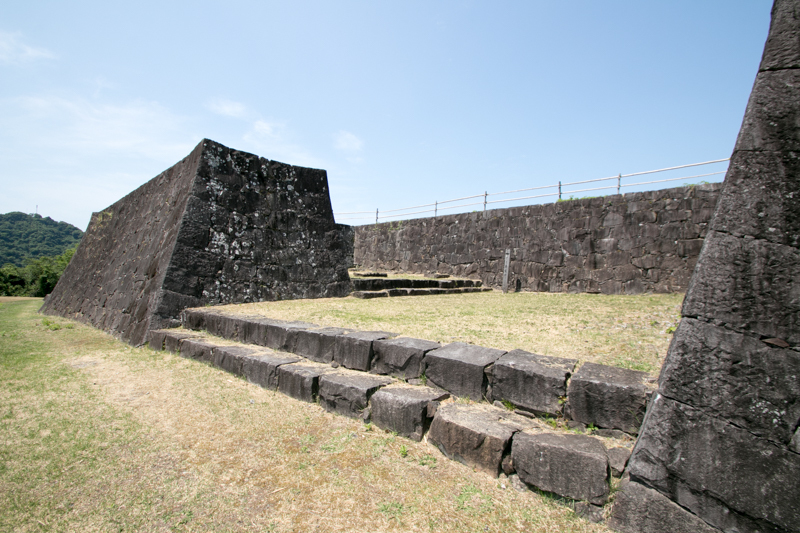 Rebellion army once occupied Sashiki castle, but failed the siege of Yatsushiro castle then Kunikane died in the battle. 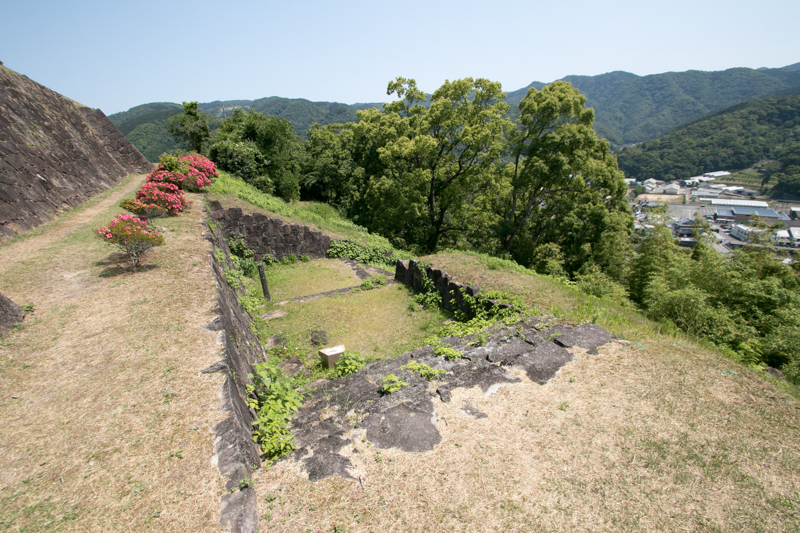 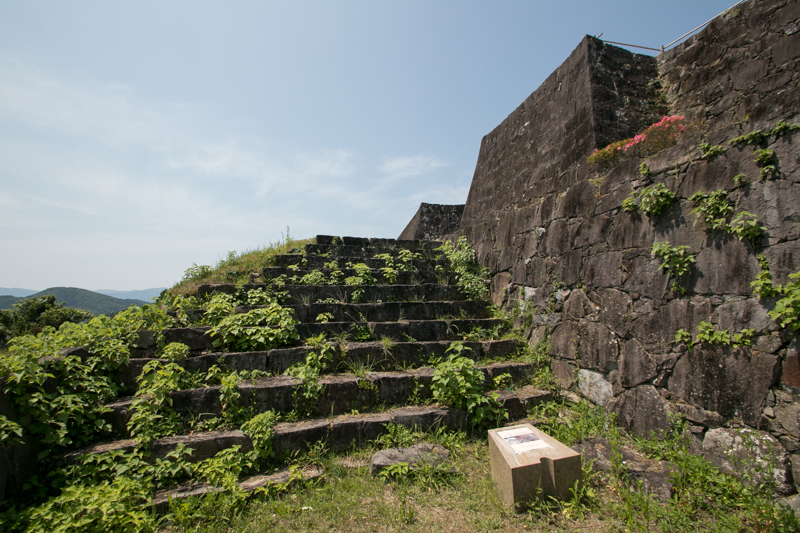 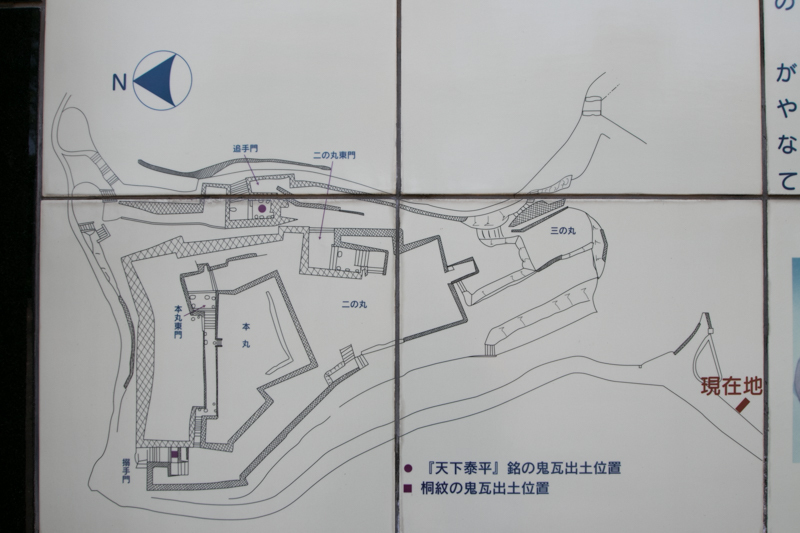 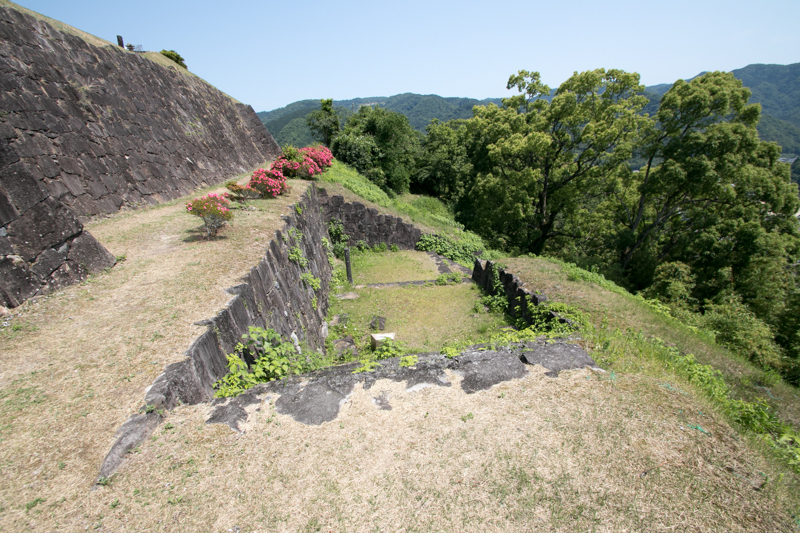 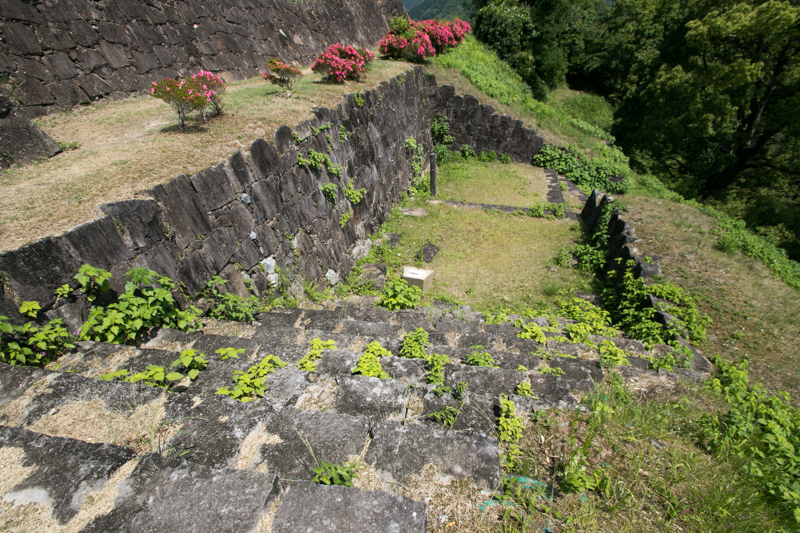 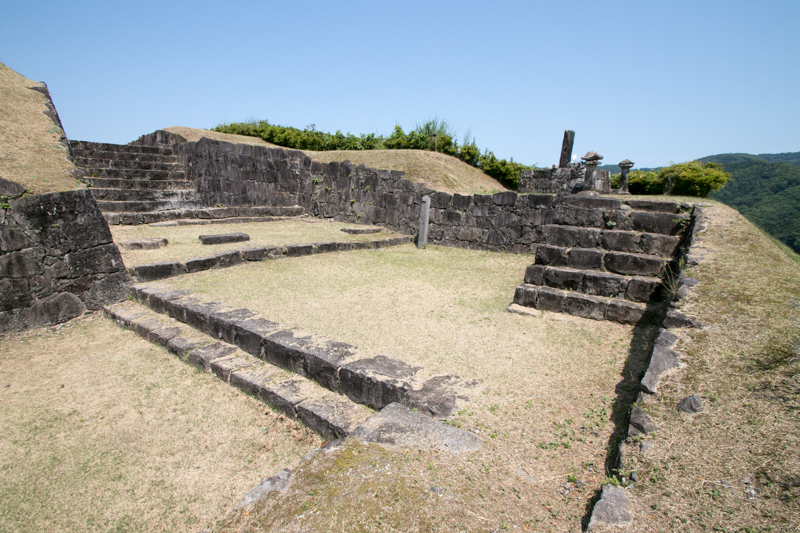 After the cease fire, Kiyomasa totally renovated Sashiki castle into a modern fort. Kiyomasa was an excellent castle master for military purpose and known as a builder or planner of huge and secure castles such as Kumamoto castle (Kumamoto prefecture) or Nagoya castle (Aichi prefecture). Sashiki castle was a small branch castle but Kiyomasa input his knowledge and technique into the construction of castle. 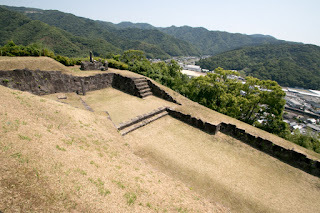 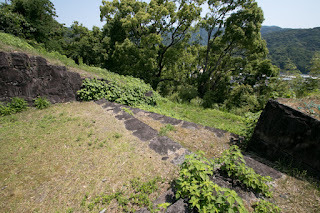 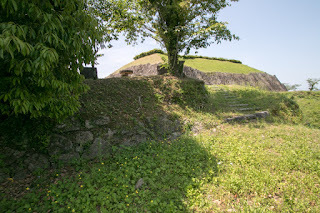 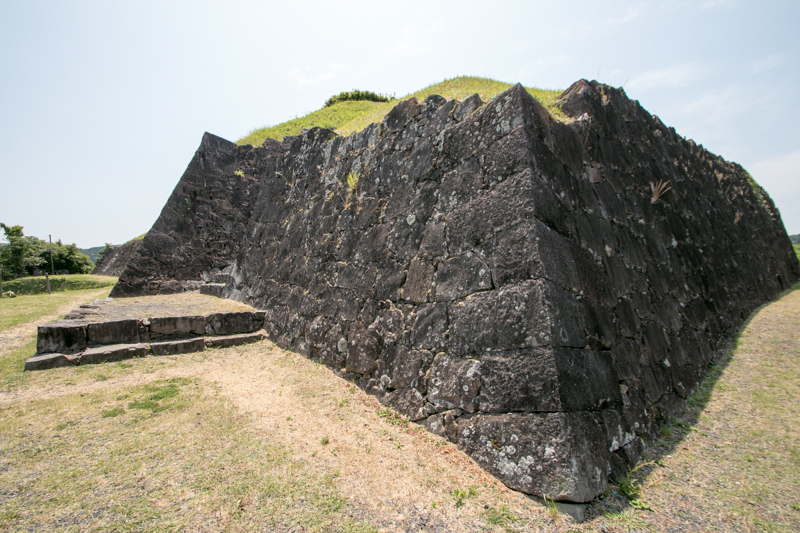 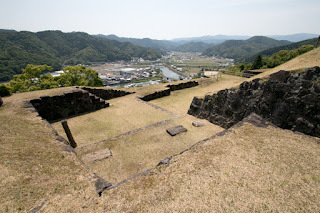 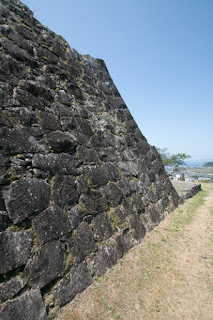 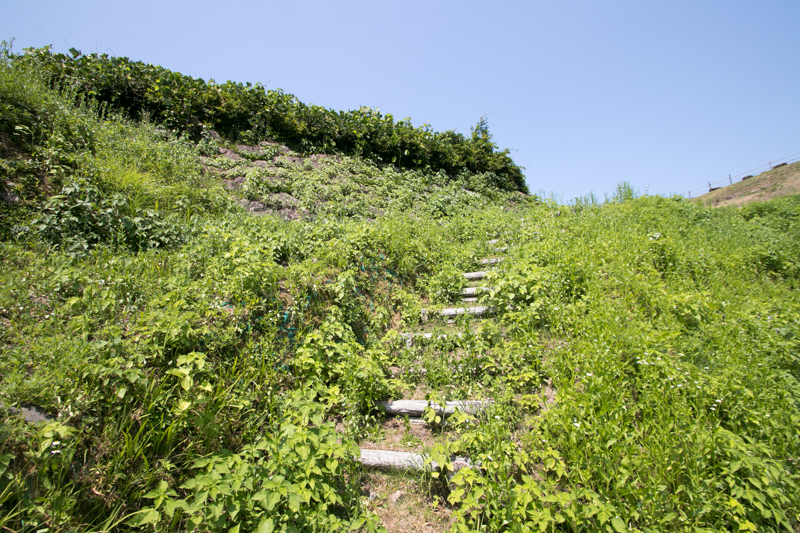 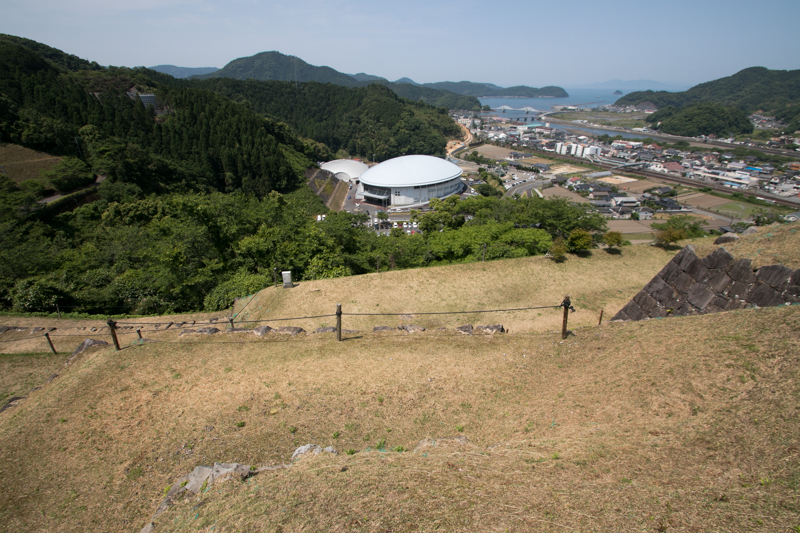 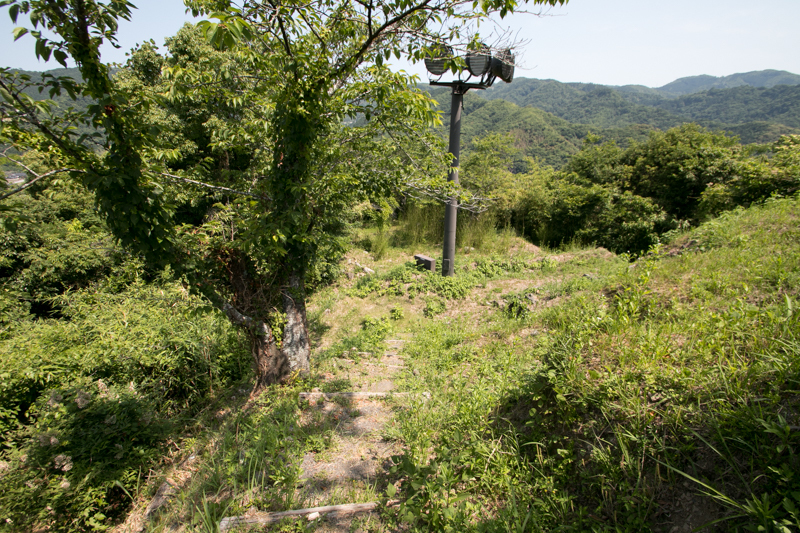 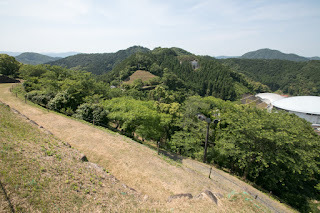 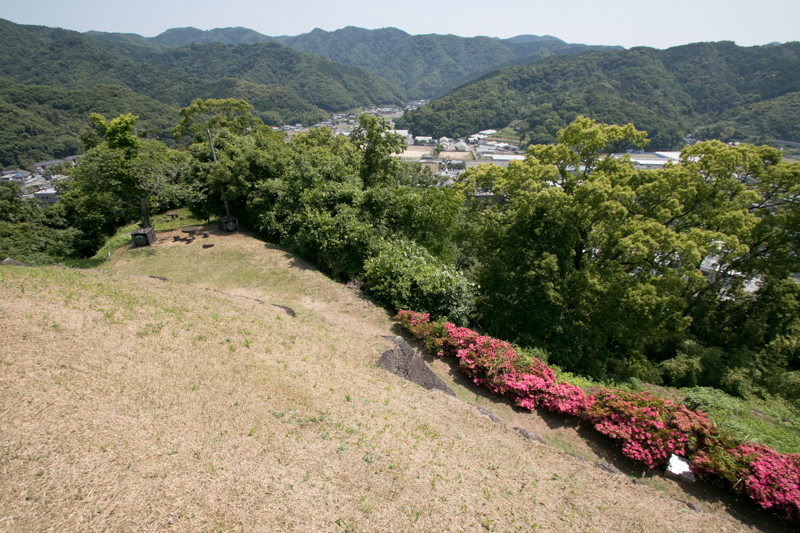 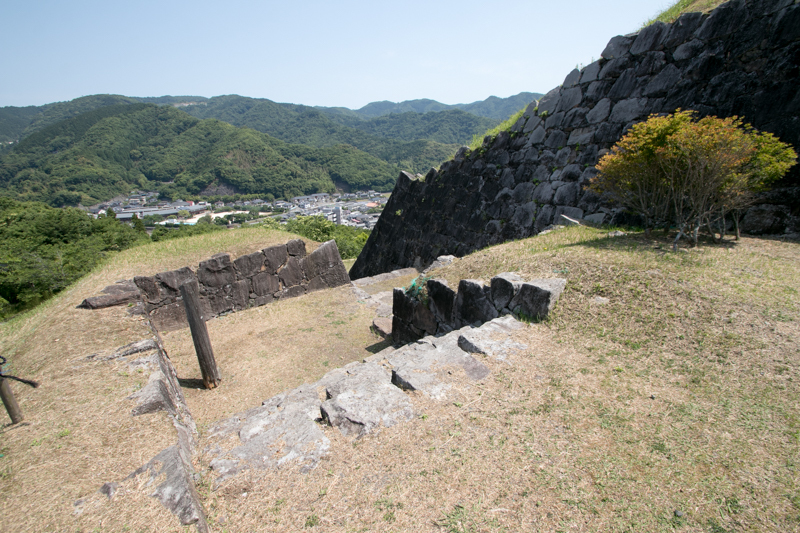 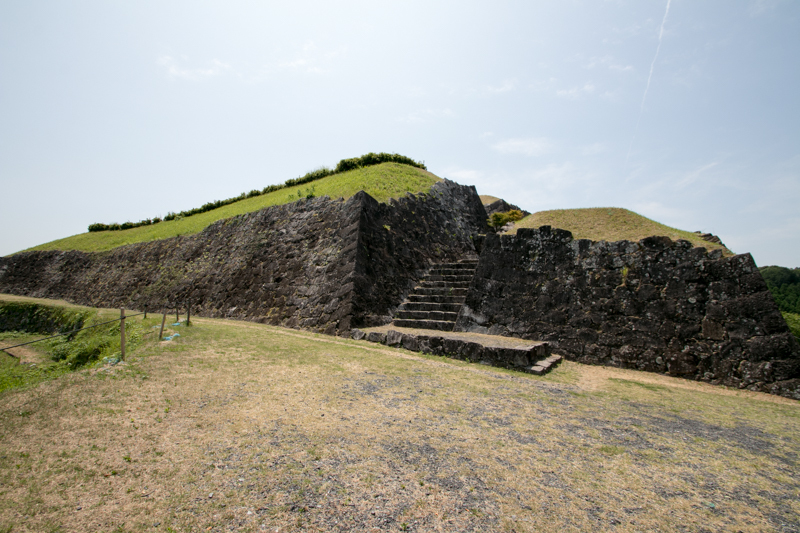 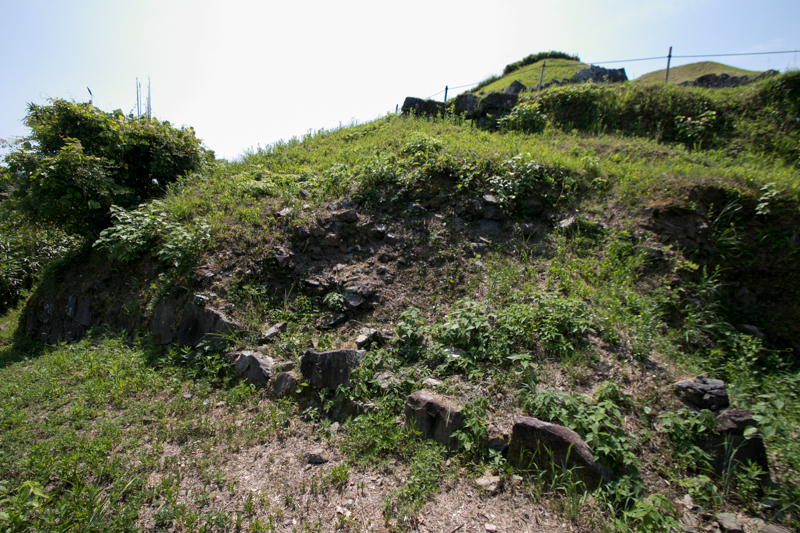 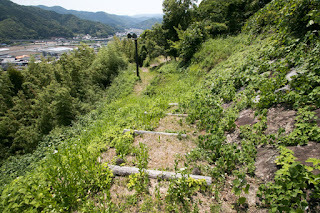 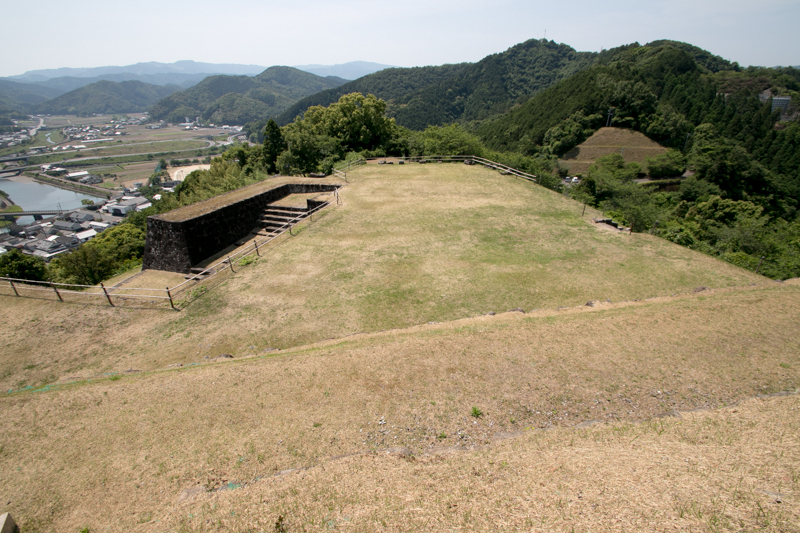 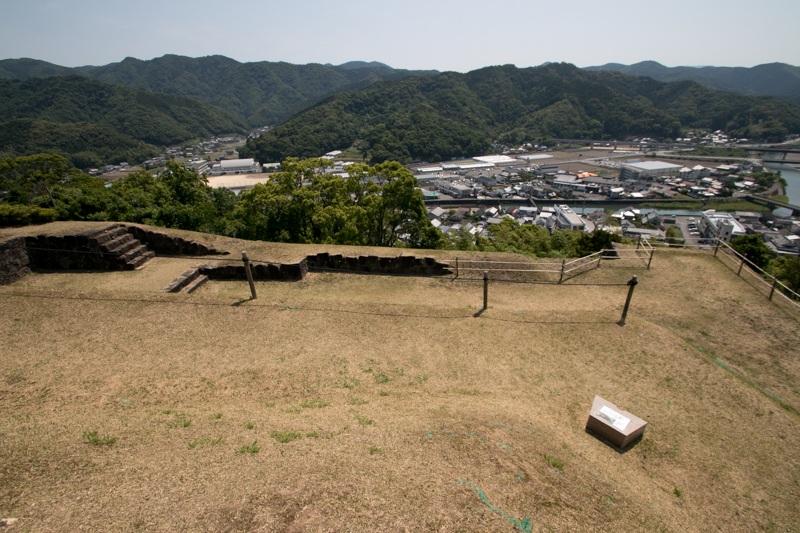 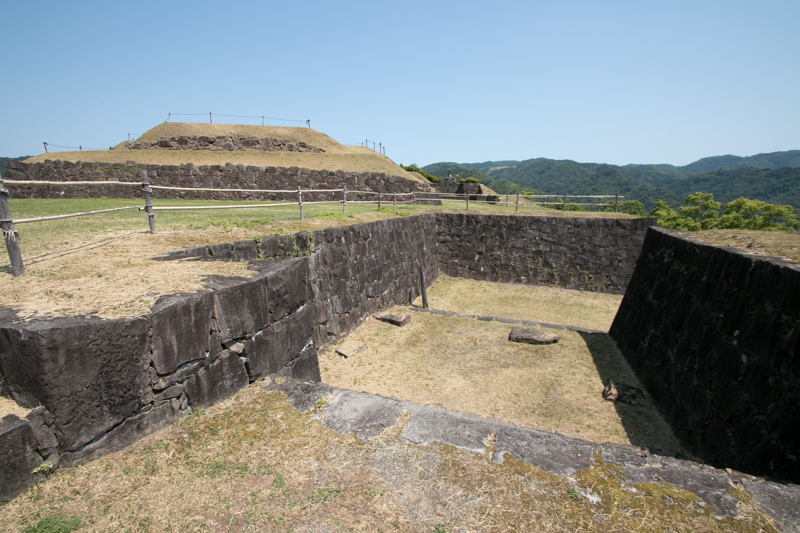 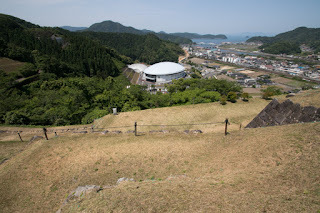 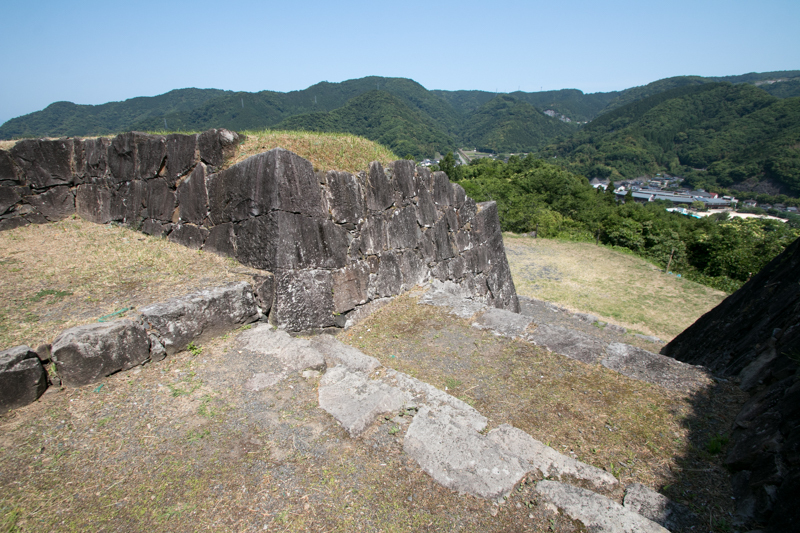 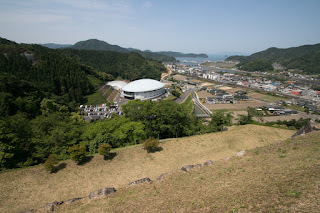 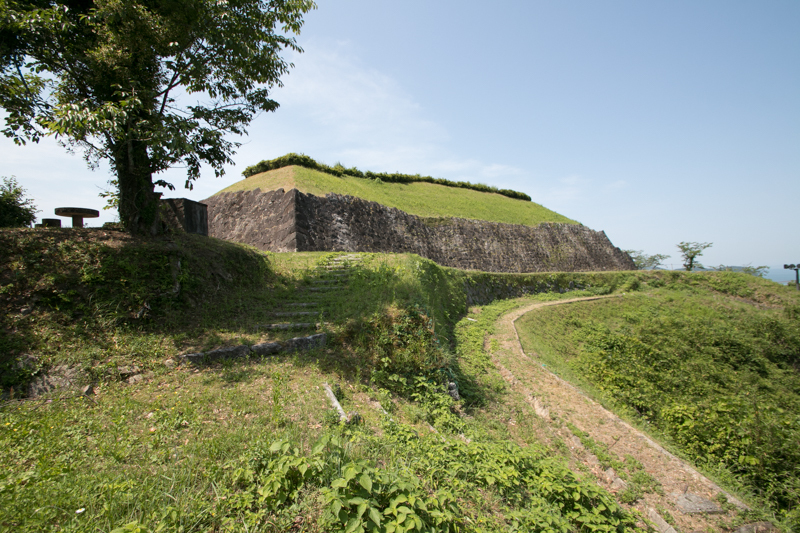 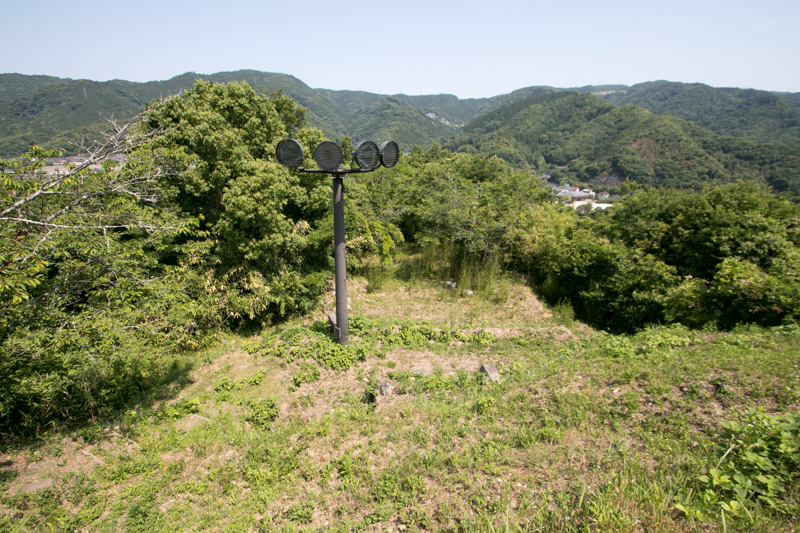 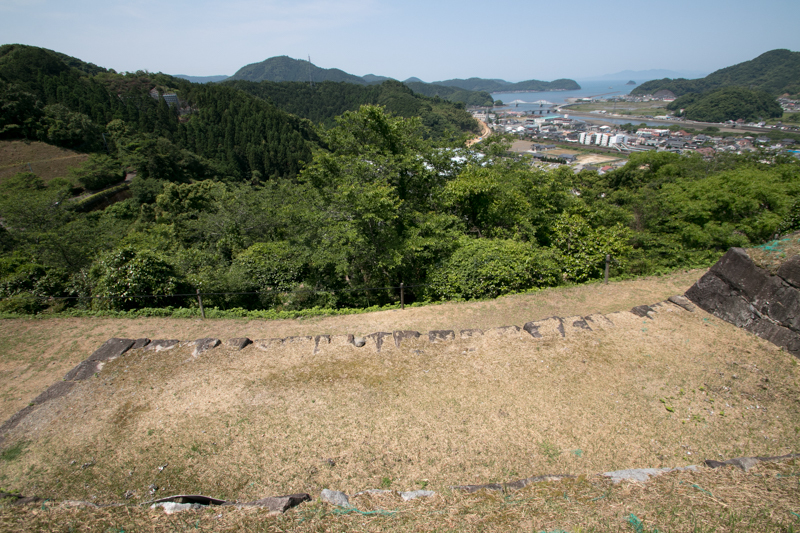 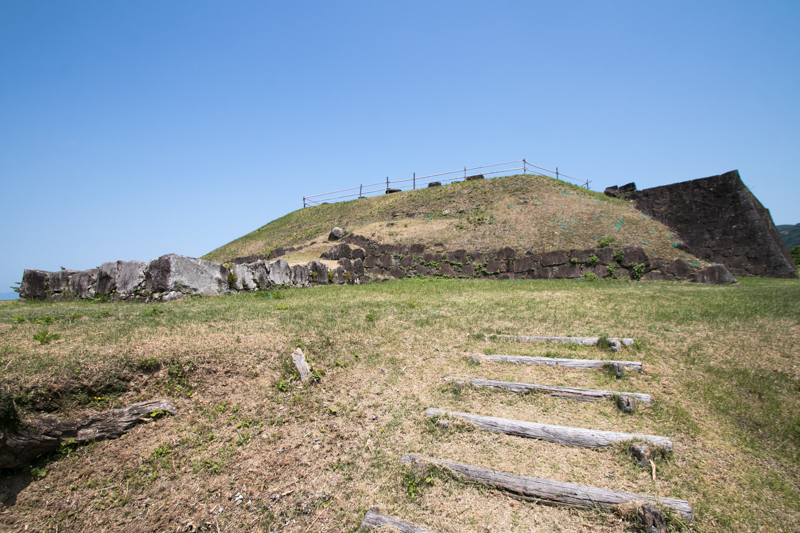 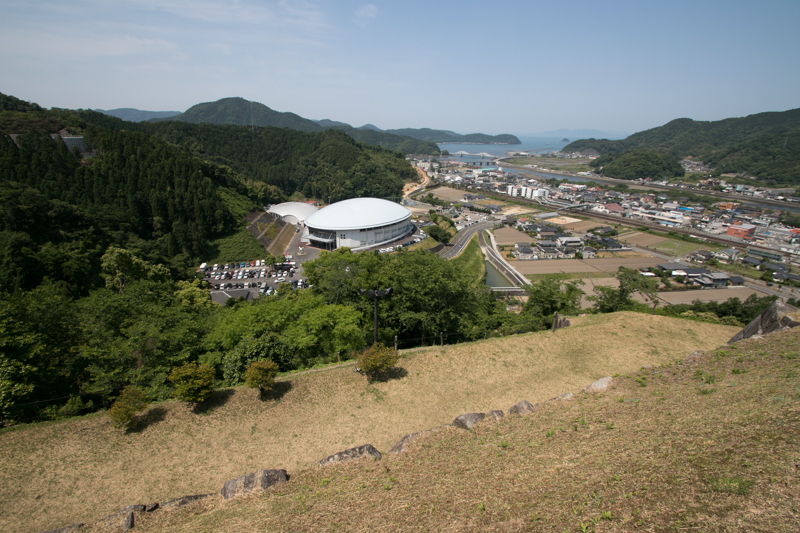 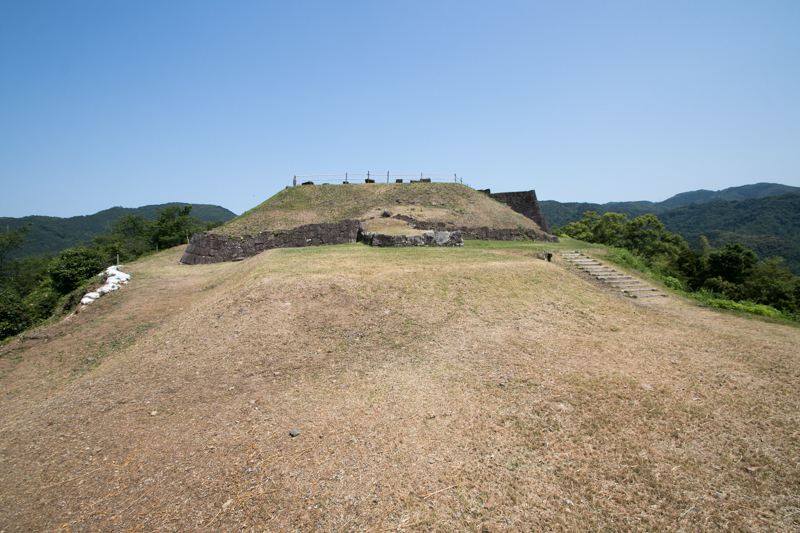 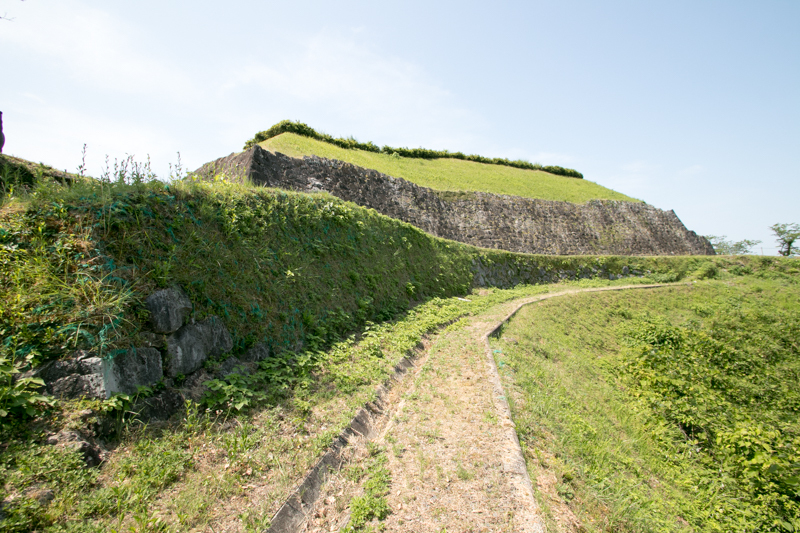 Sashiki castle is built on a hill like an arrowhead shape heading southward. 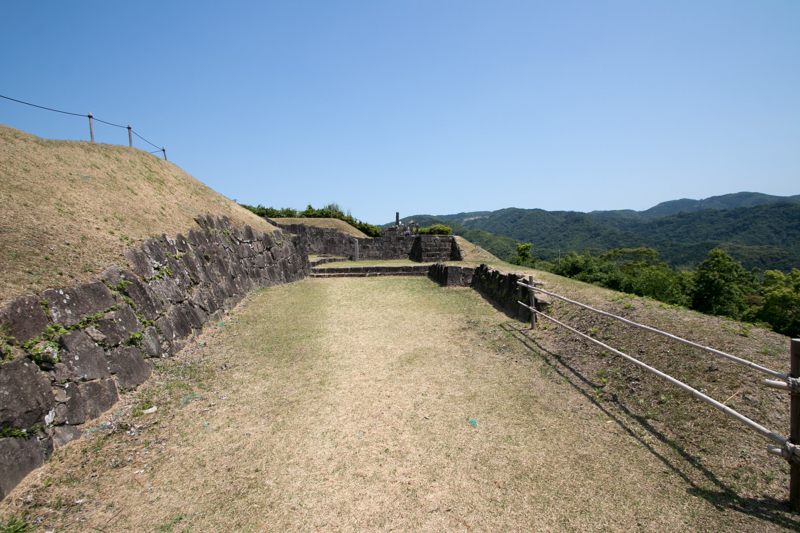 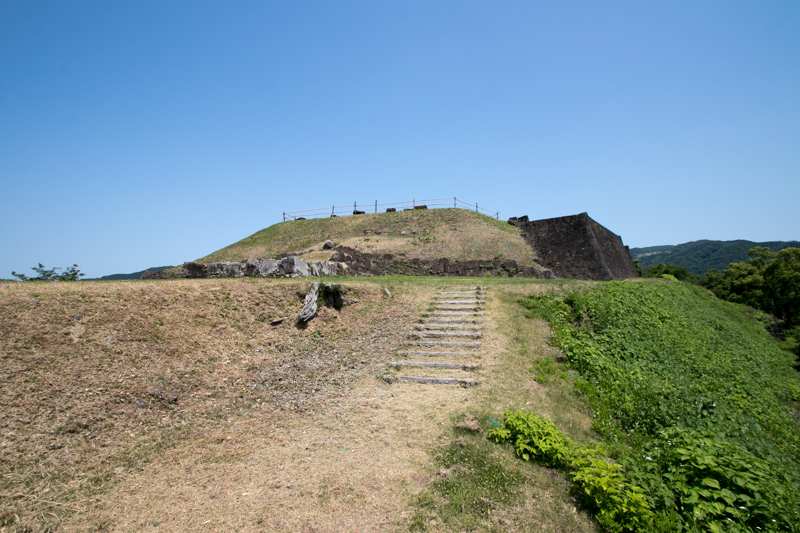 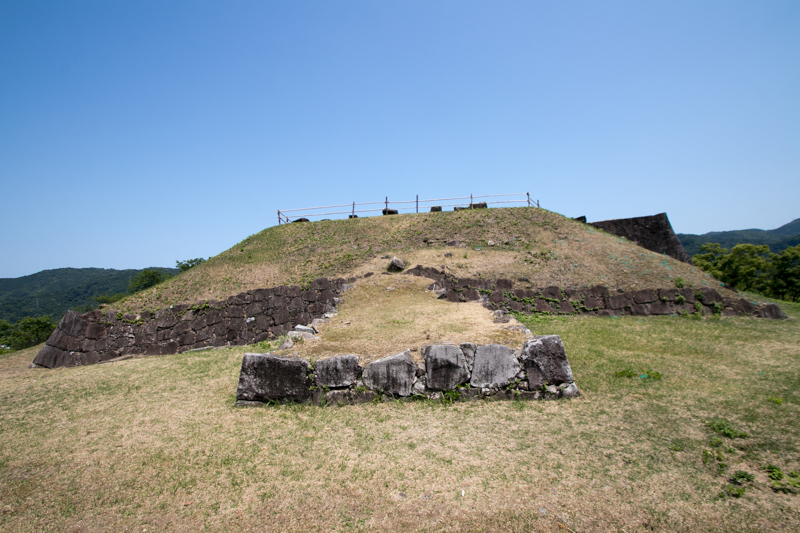 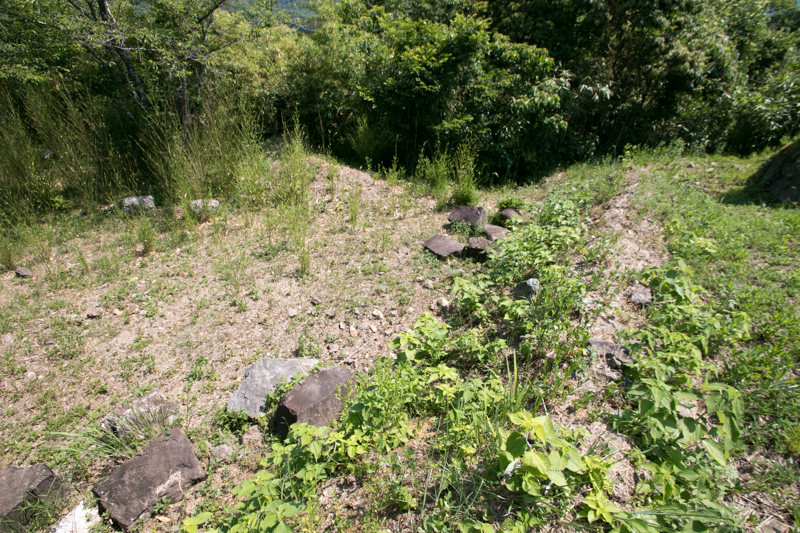 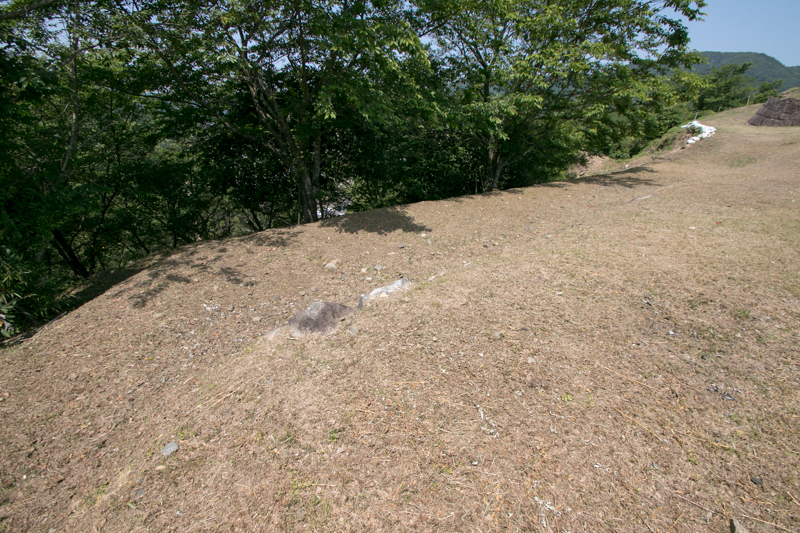 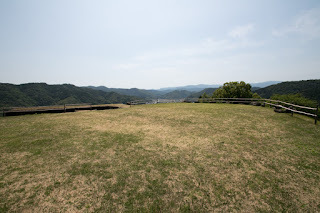 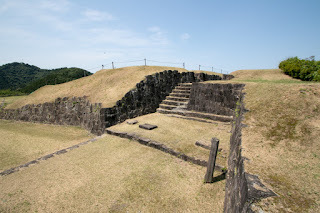 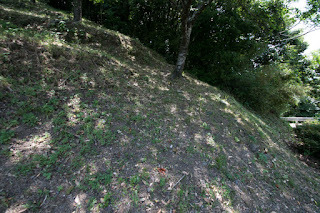 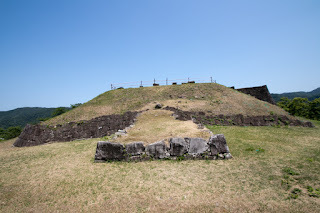 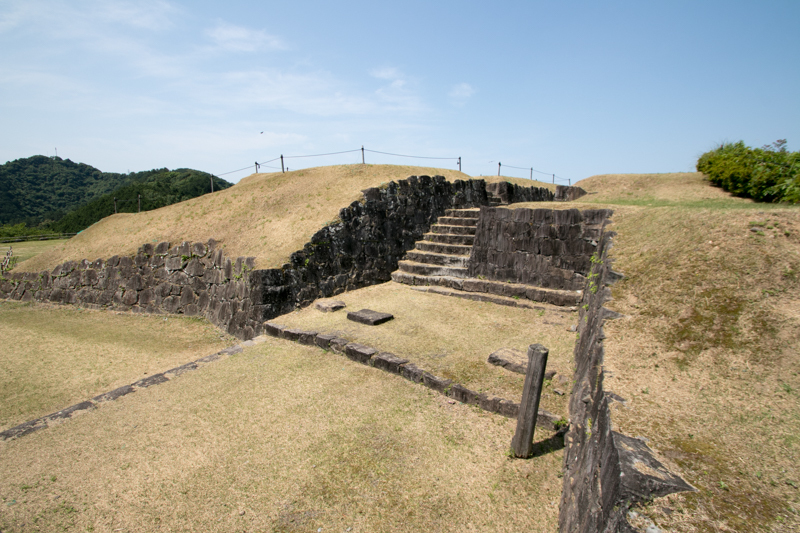 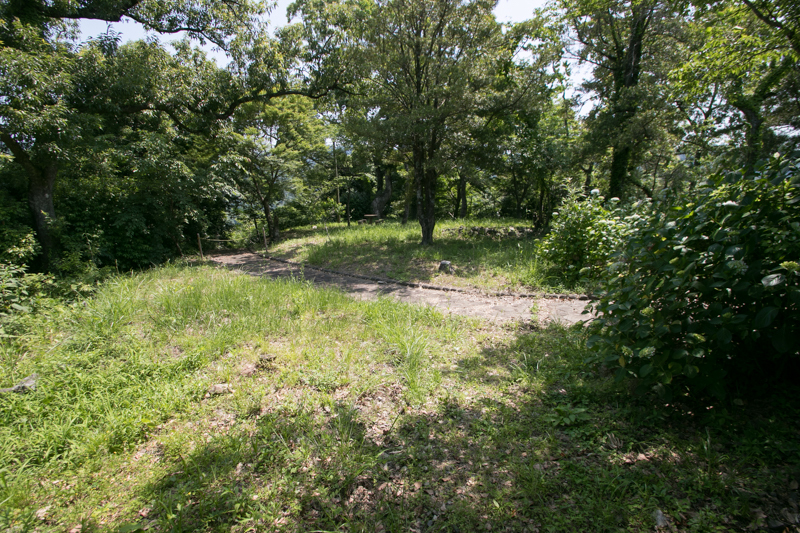 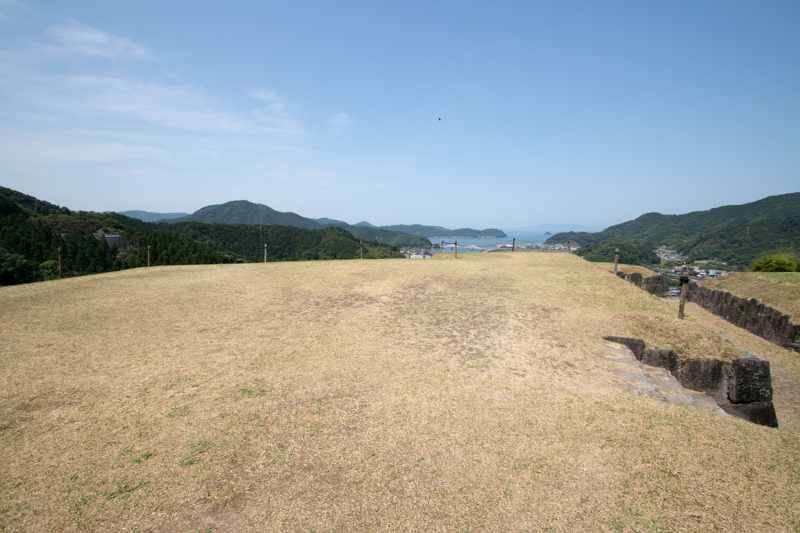 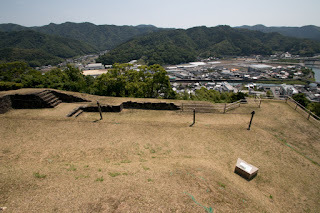 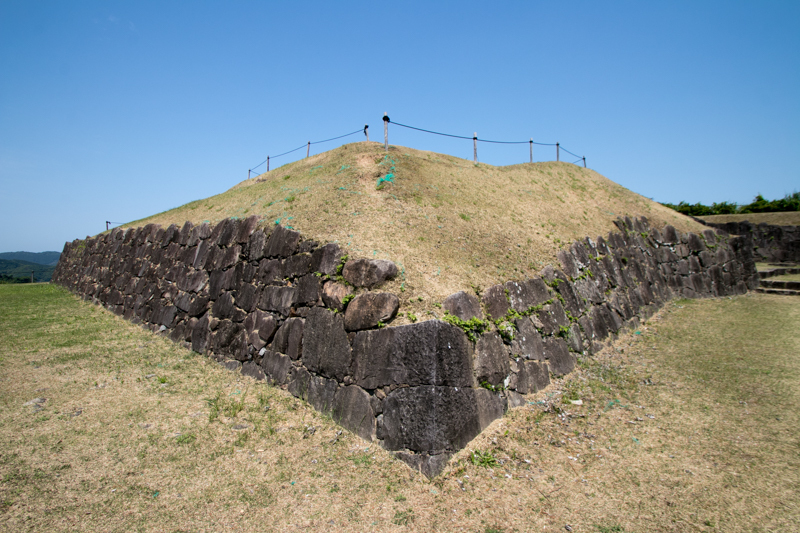 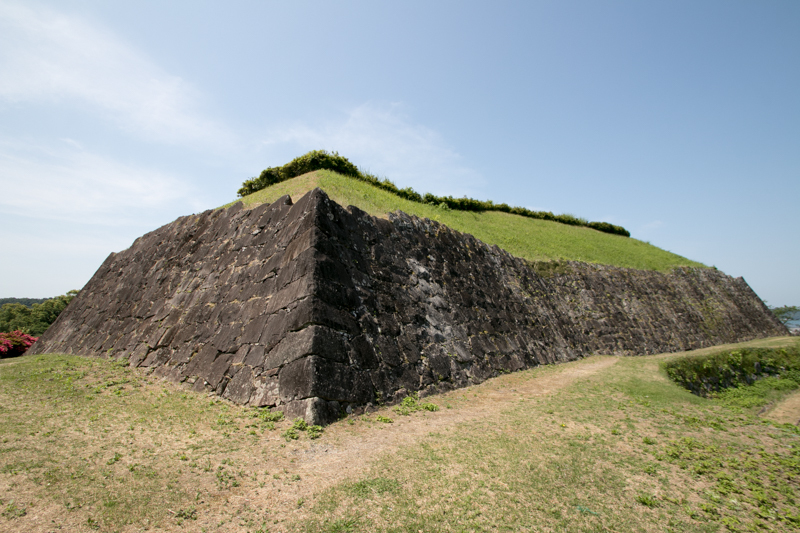 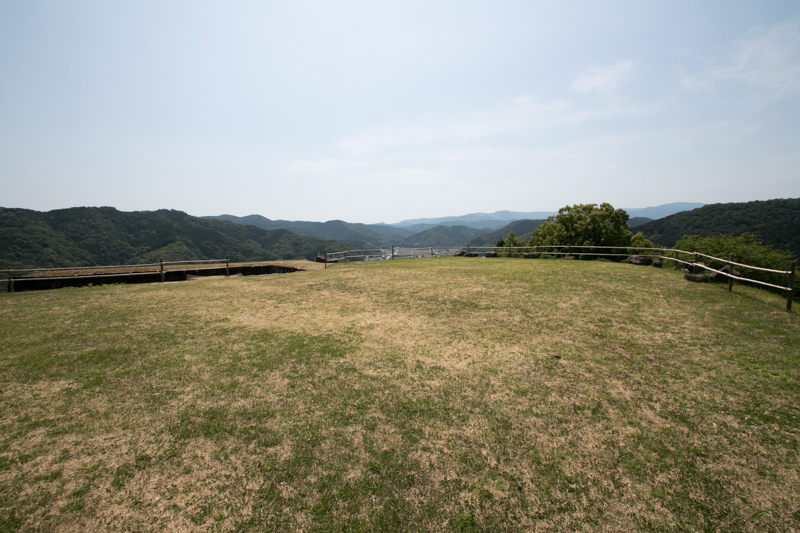 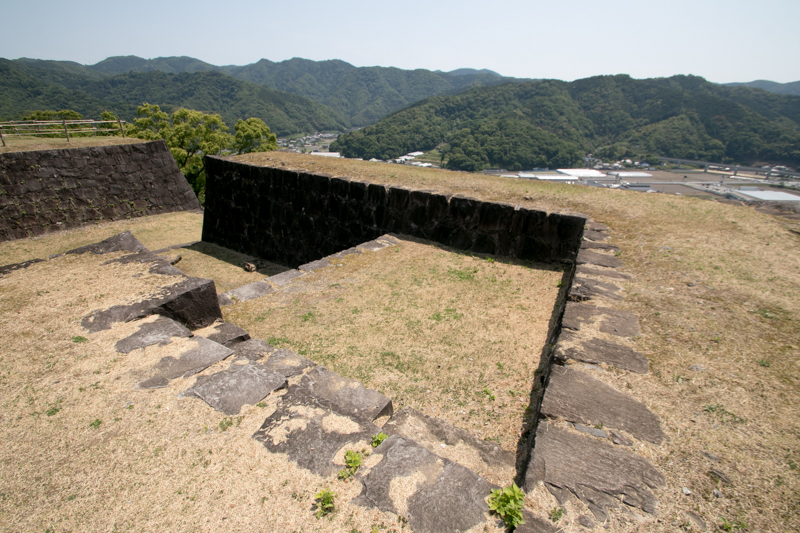 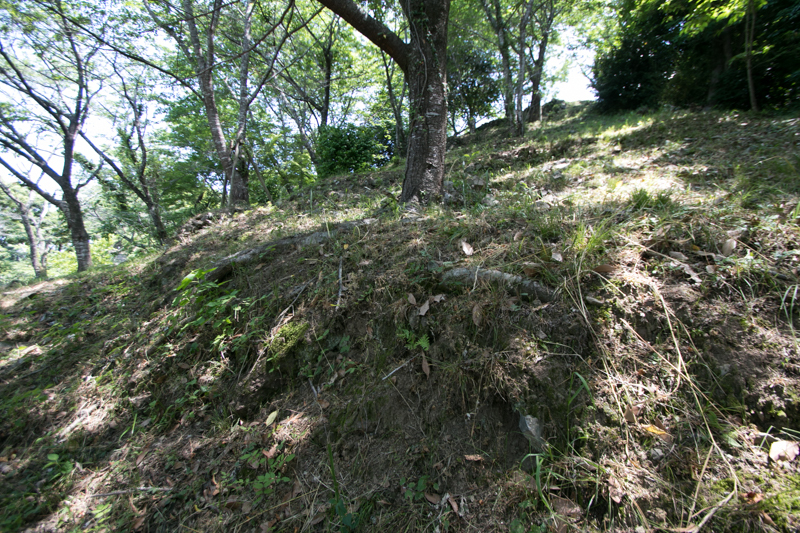 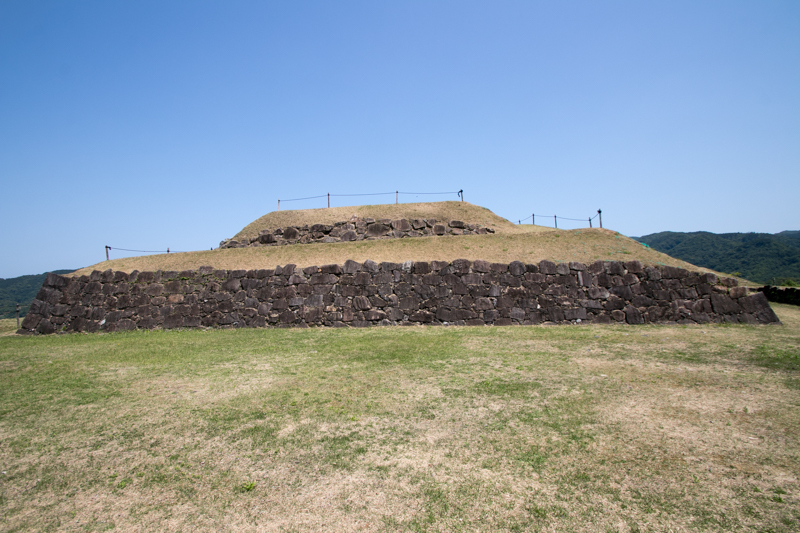 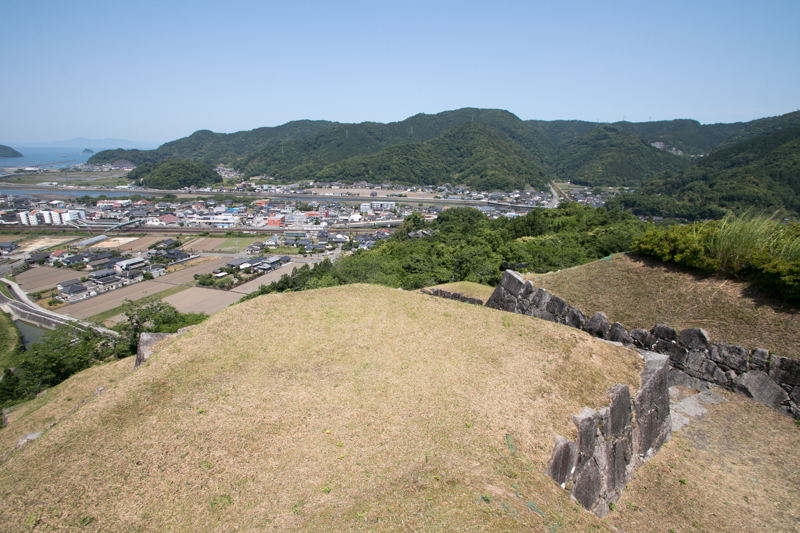 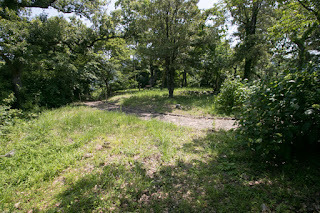 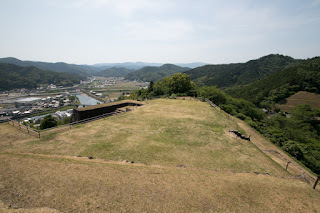 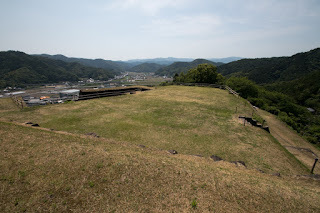 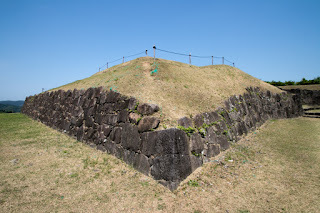 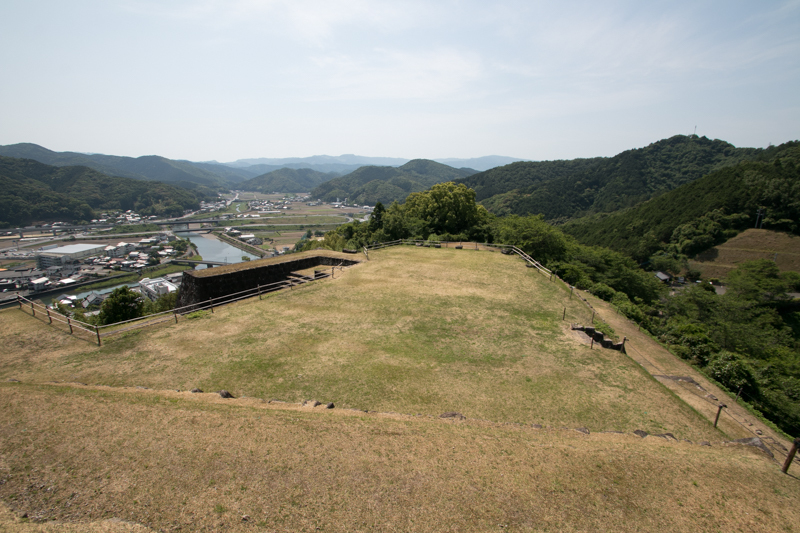 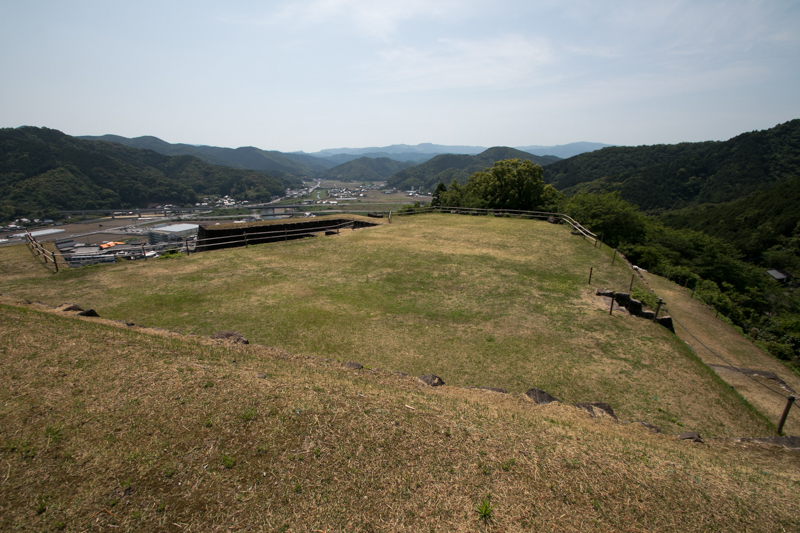 Central area of the castle is a trapezoid shaped area at the highest point of the hill, and secondary area spread along the ridge toward south. 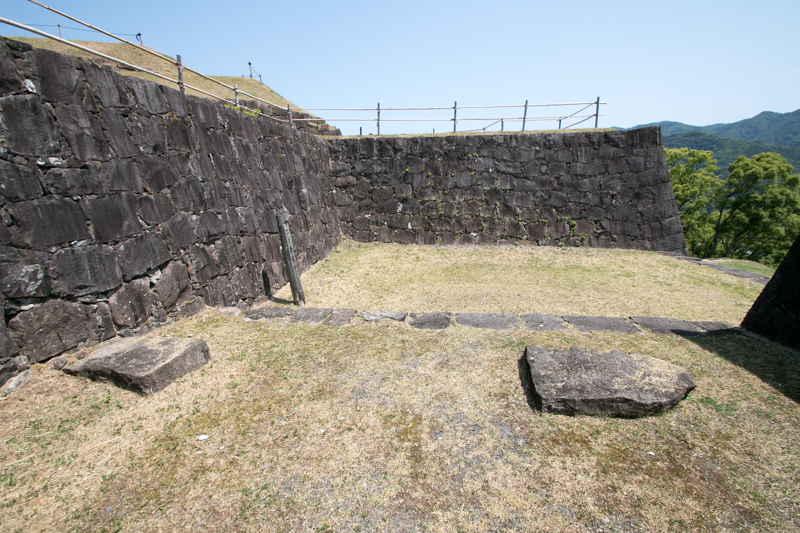 Gates of central area and secondary area except for front gate renovated later are narrow, and in case of emergency these gate might be filled by sand to shut them. 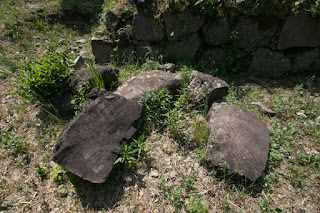 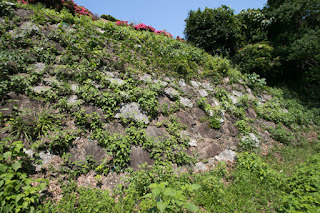 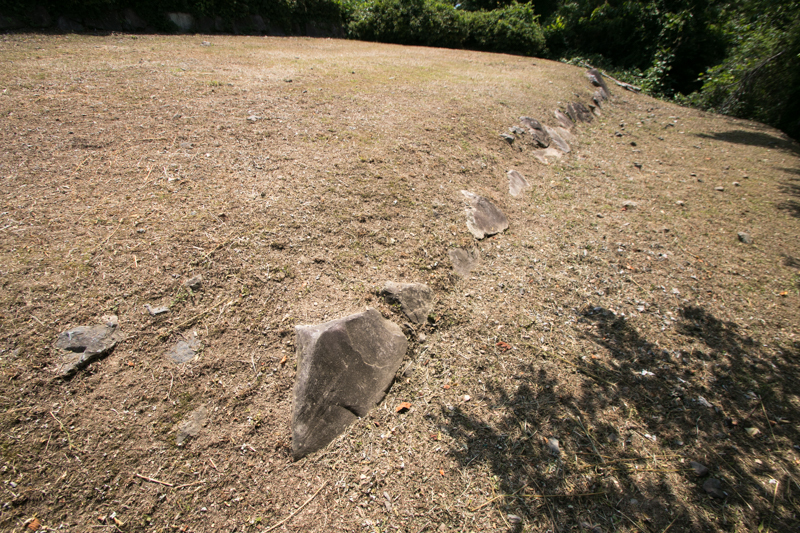 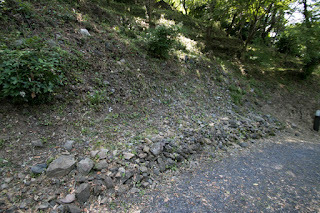 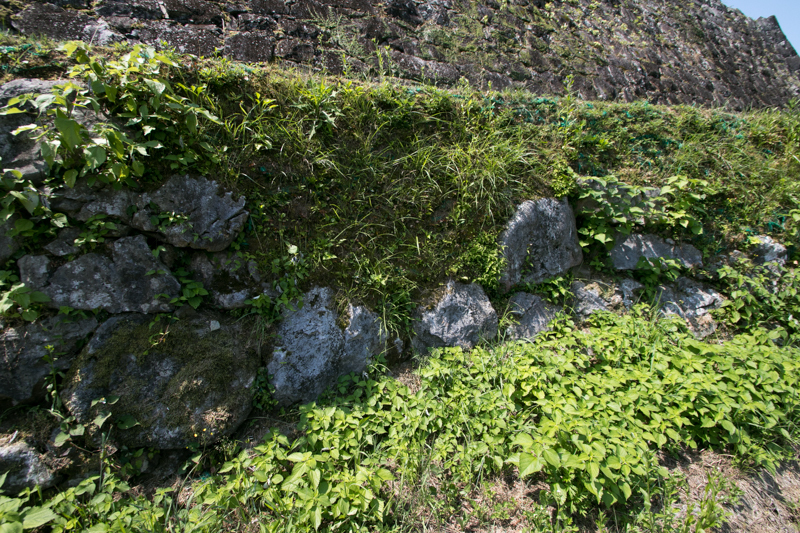 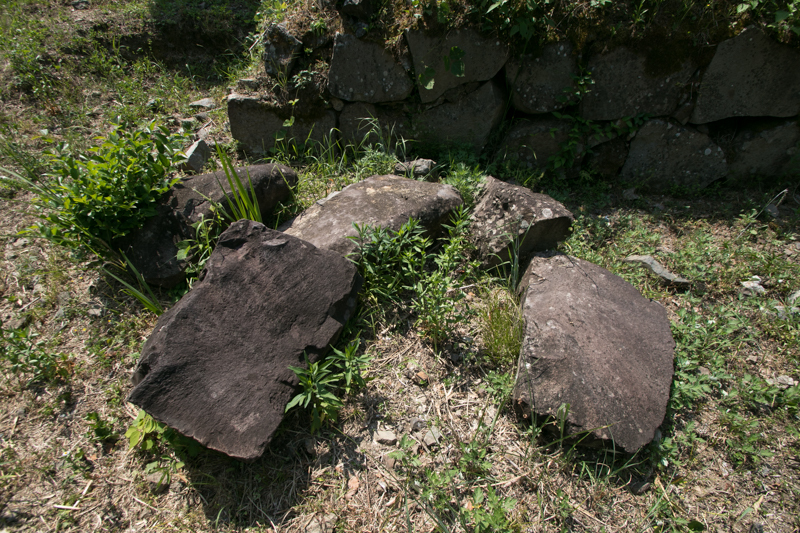 Stone walls of the central area and secondary area might be built in 1590's, thus it is built in Nodura-dumi style, an old style of stone wall consist of different size and unshaped stones. 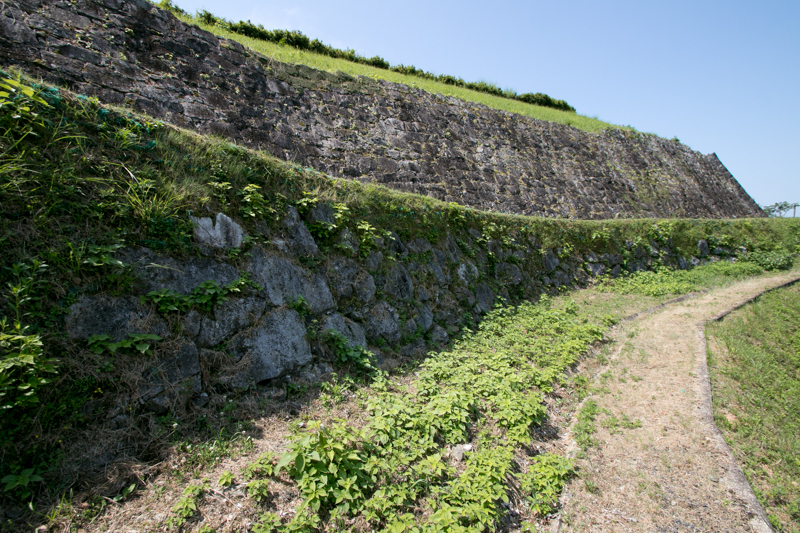 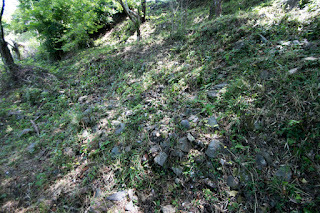 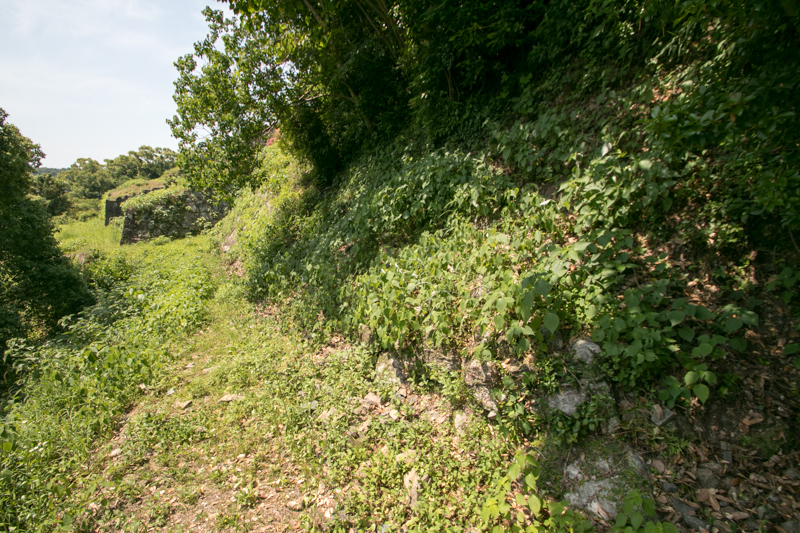 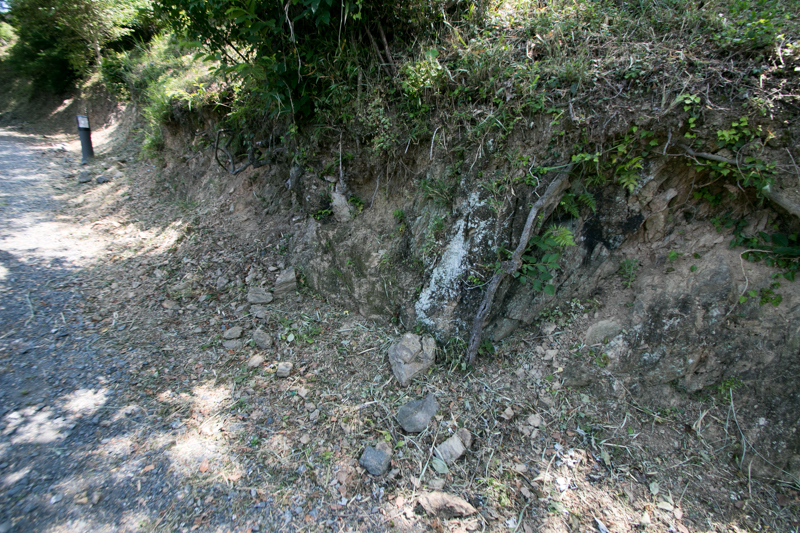 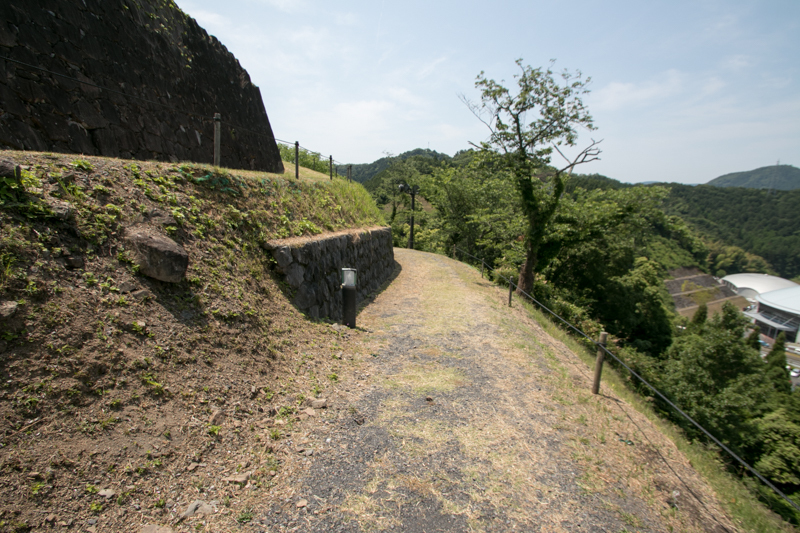 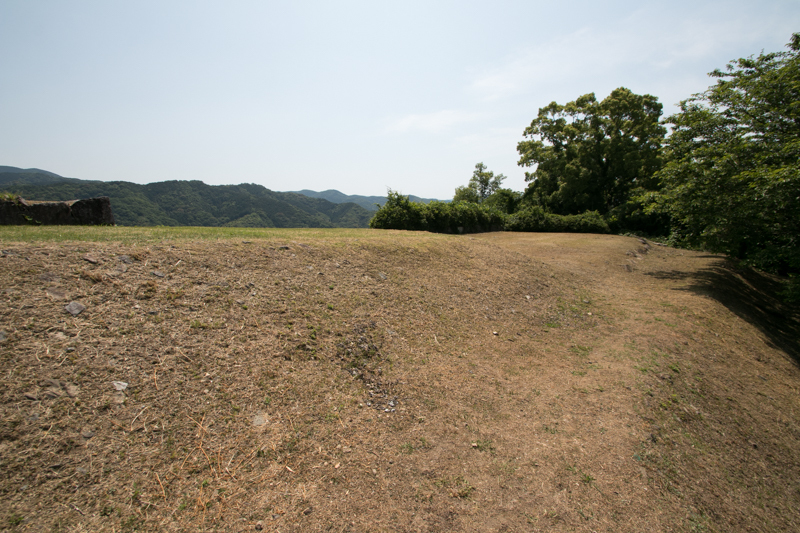 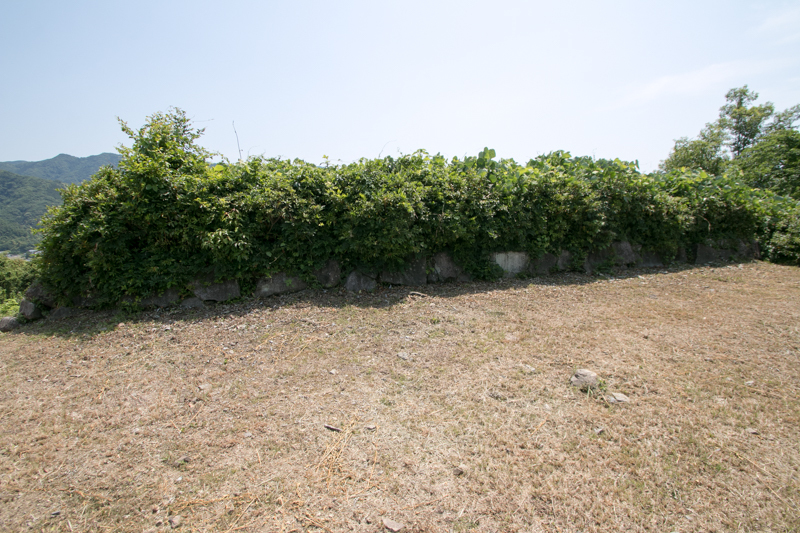 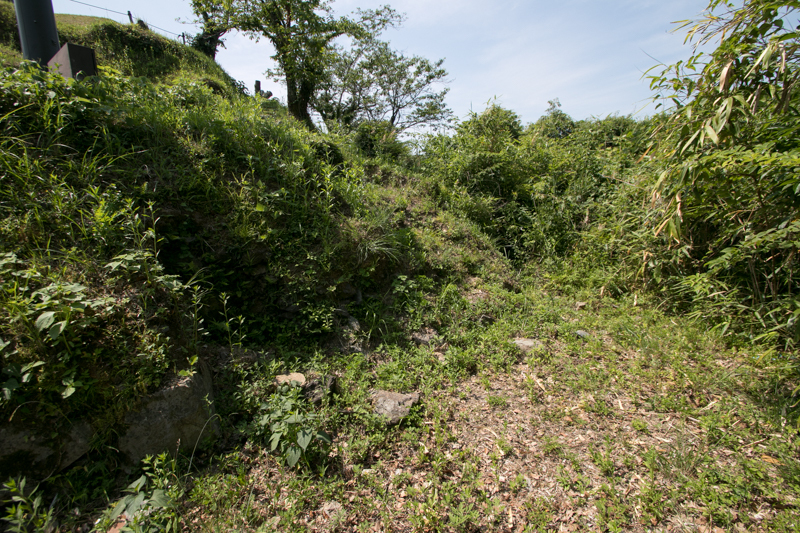 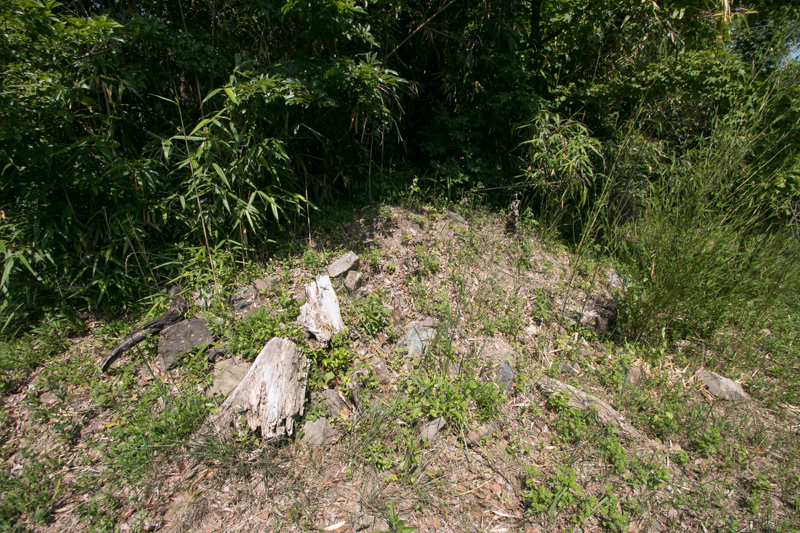 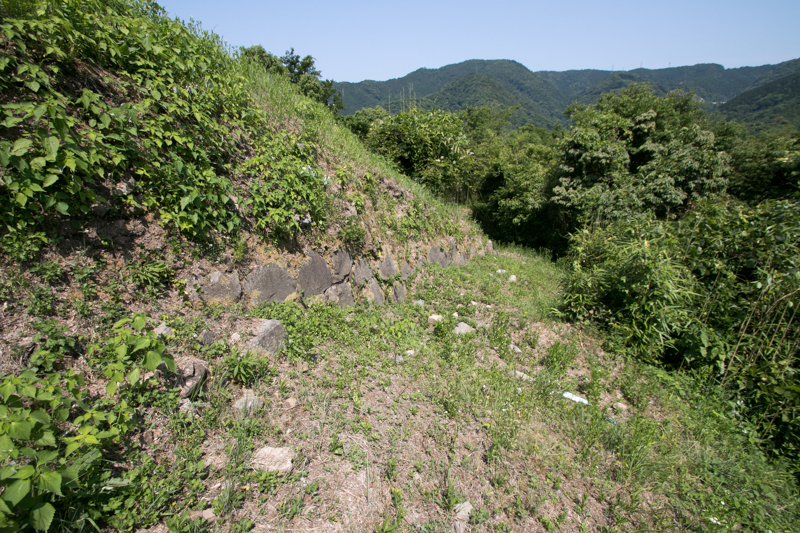 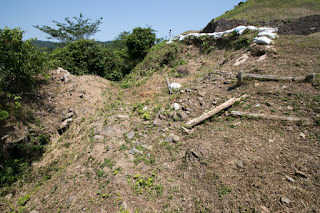 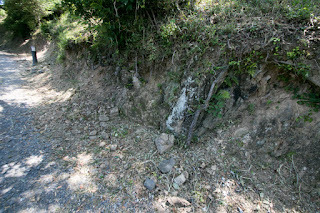 Stone walls of these area is not so high, but complexly folded to erase the dead angle and to shot the enemy from side direction. Ahead of secondary area there was a large size third area, but this area was not so renovated and kept the original style. After the death of Hideyoshi, Ieyasu Tokugawa (1543-1616), the largest lord under Toyotomi government, and Mitsunari Ishida (1560-1600), the chief administrative staff of Toyotomi government, fought for the next hegemony. 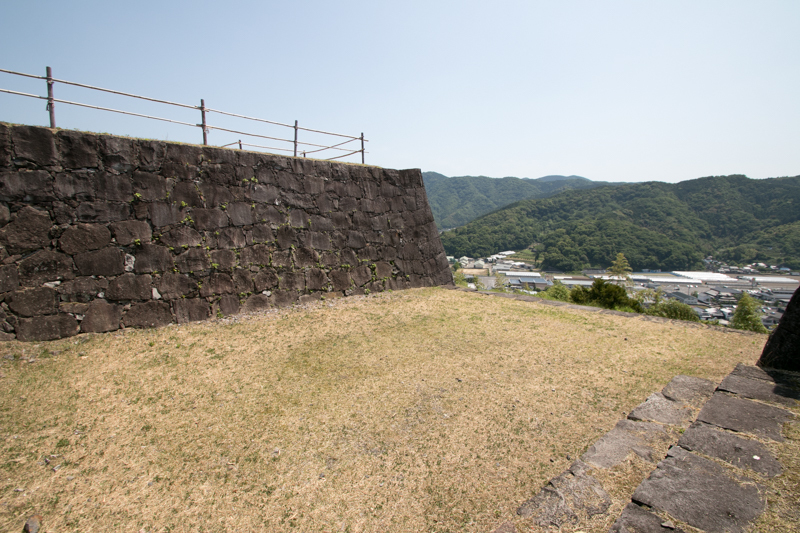 As a front general of Toyotomi government Kiyomasa was quite on bad term with Mitsunari, and belonged to Ieyasu as a matter of course. On the other hand, Shimazu clan supported Mitsunari in the course of events. 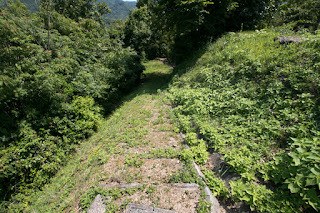 Yukinaga Konishi who had the south half of Higo province was close to Mitsunari and also followed. 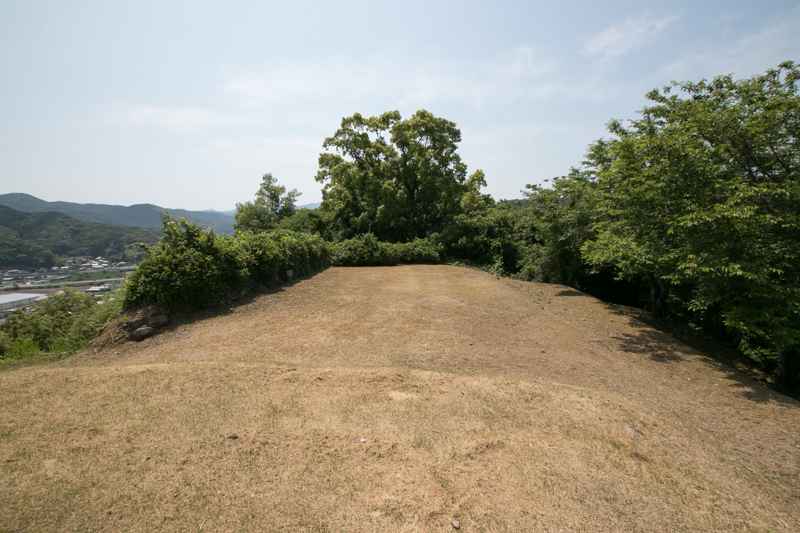 At the battle of Sekigahara between both party, Sasiki castle was surrounded by Shimazu clan and Konishi clan and became isolated. Shimazu army marched to Sashiki castle and encircled it, but Sashiki castle stood one month attack and Shimazu clan heard the defeat of Mitsunari at the battle retreated to Satsuma province. After the battle of Sekigahara, Kiyomasa achieved former territory of Yukinaga Konishi and became the lord of most part of Higo province. 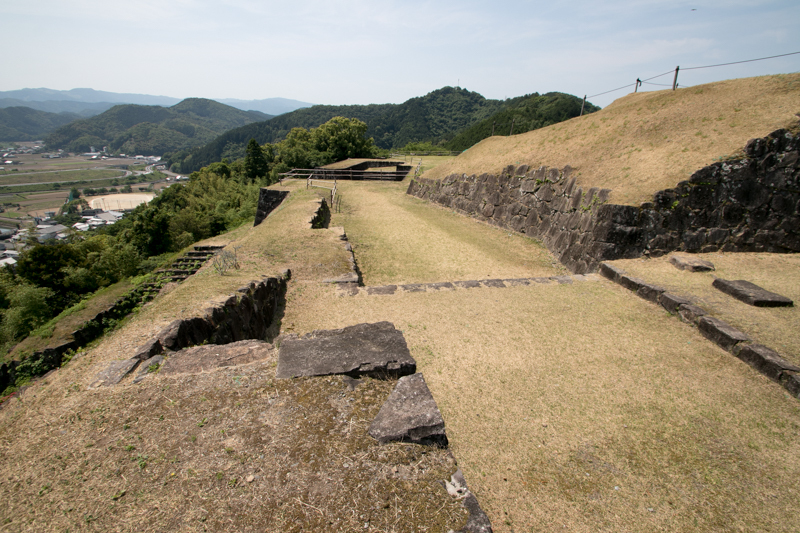 As a lord of large territory, Kiyomasa built or reformed many castles throughout the province including his main base Kumamoto castle, Nankan castle, Mugishima castle, Uto castle and Sashiki castle. 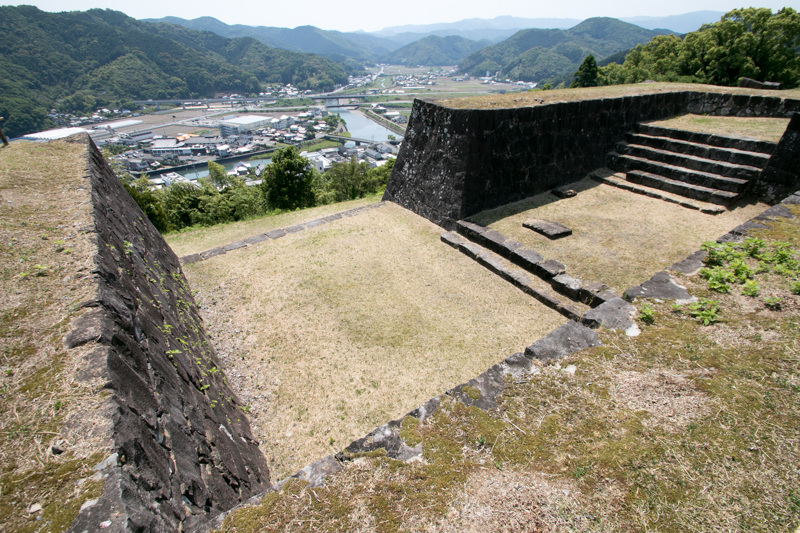 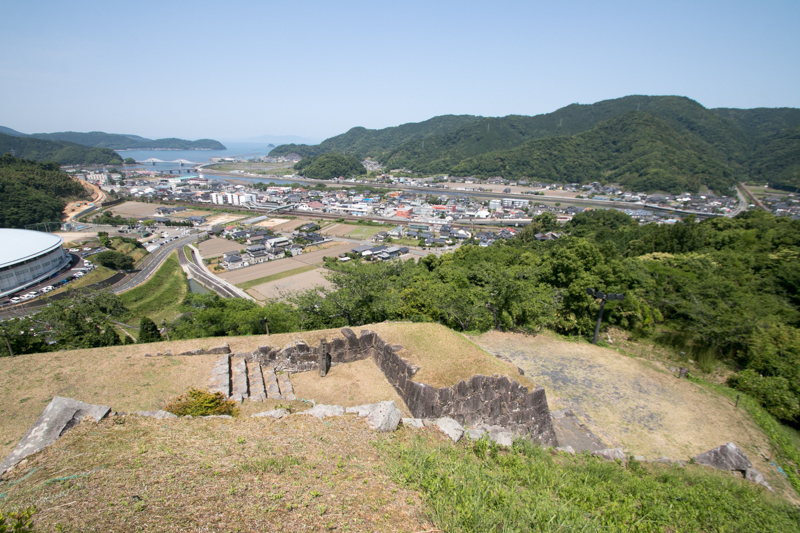 Shimazu clan finally surrendered to Ieyasu but preserved their military power, then Sashiki castle was further expanded as a backup point of Minamata castle, and also as an administrative base of the region. 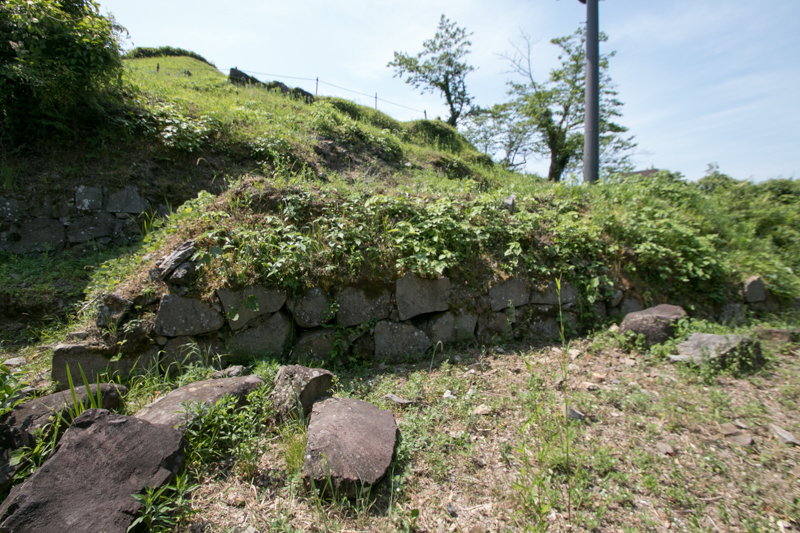 By this renovation, tall stone walls were built at the north side of central area. 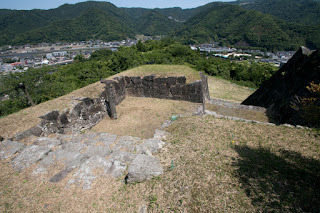 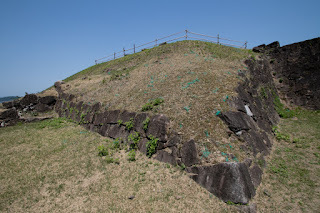 Originally this was a backside of the castle surrounded by sheer slope and not so involved in actual battle, but it was built to show the authority of Kato clan to castle town spread northward of the castle. 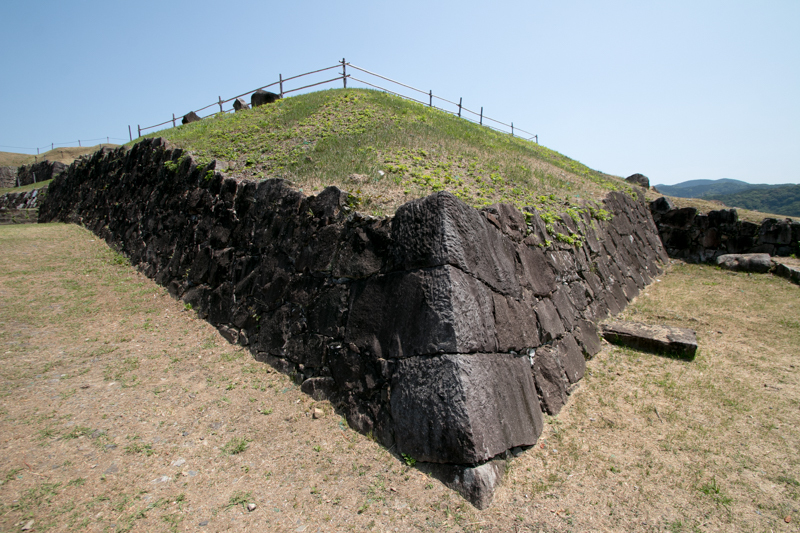 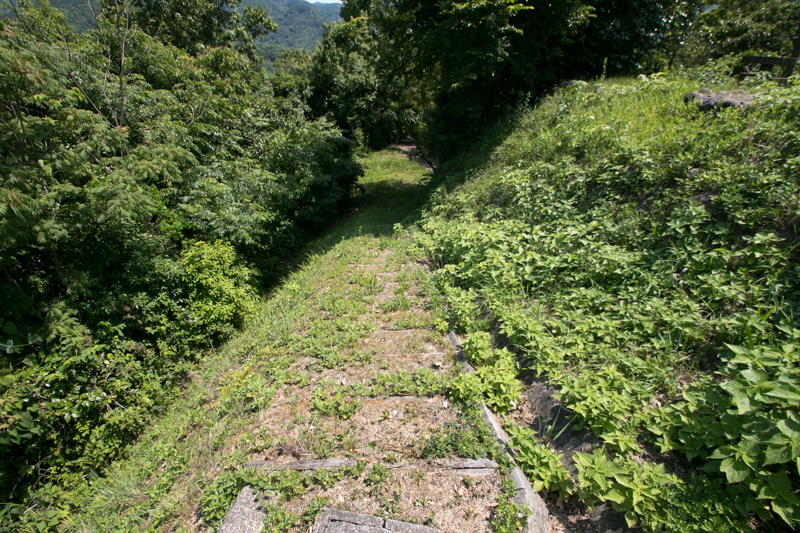 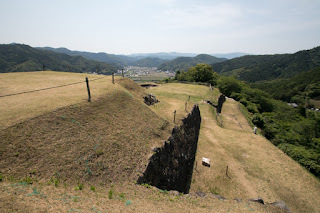 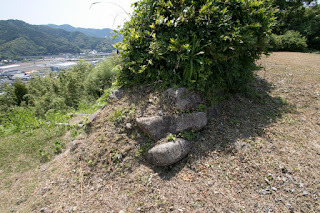 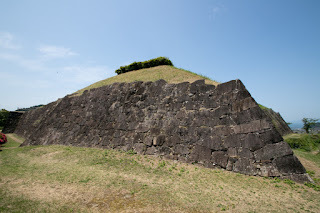 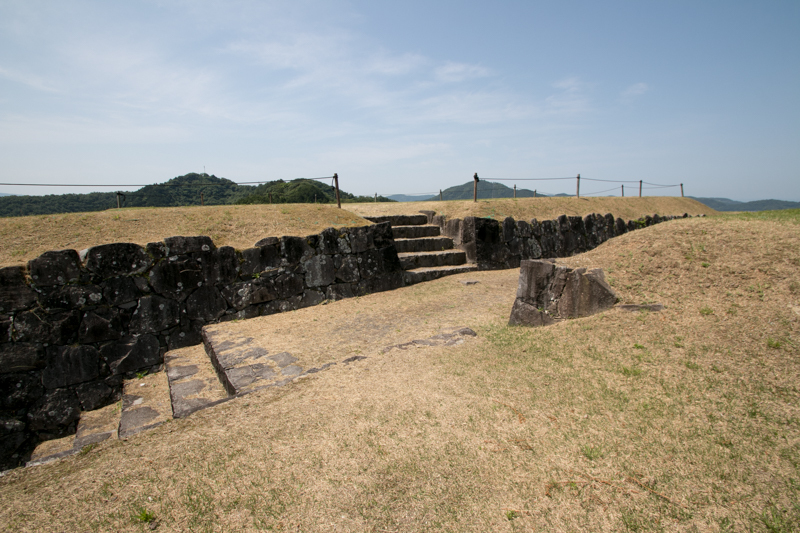 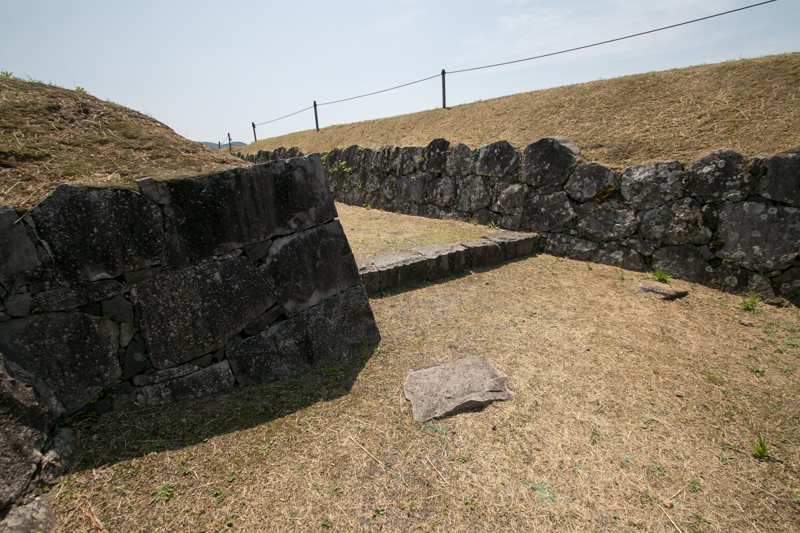 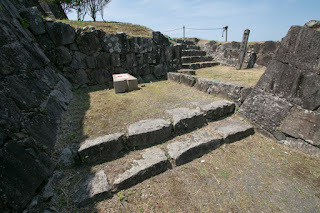 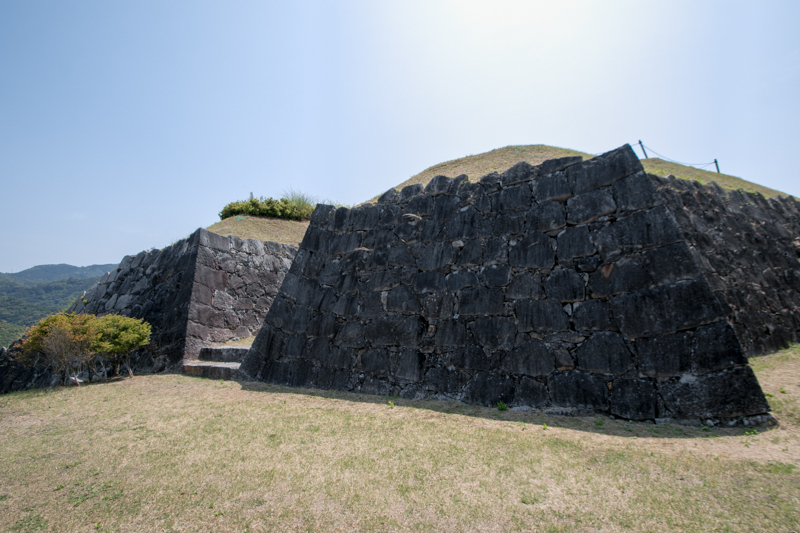 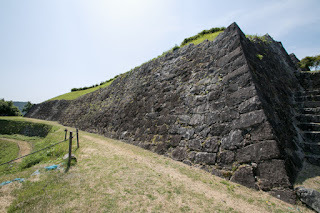 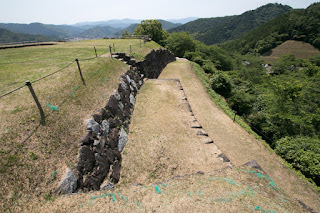 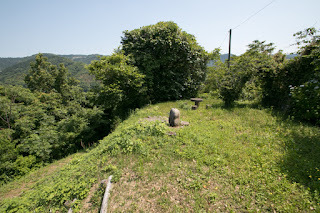 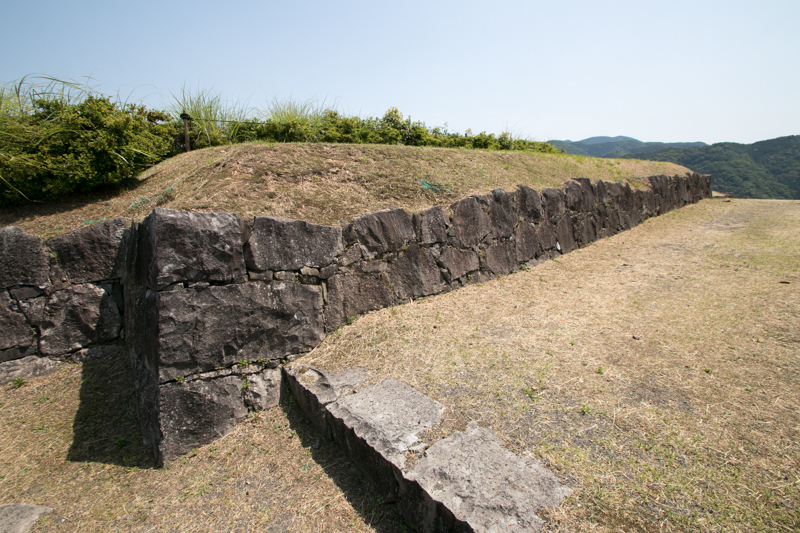 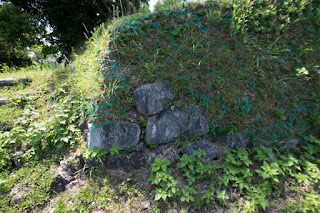 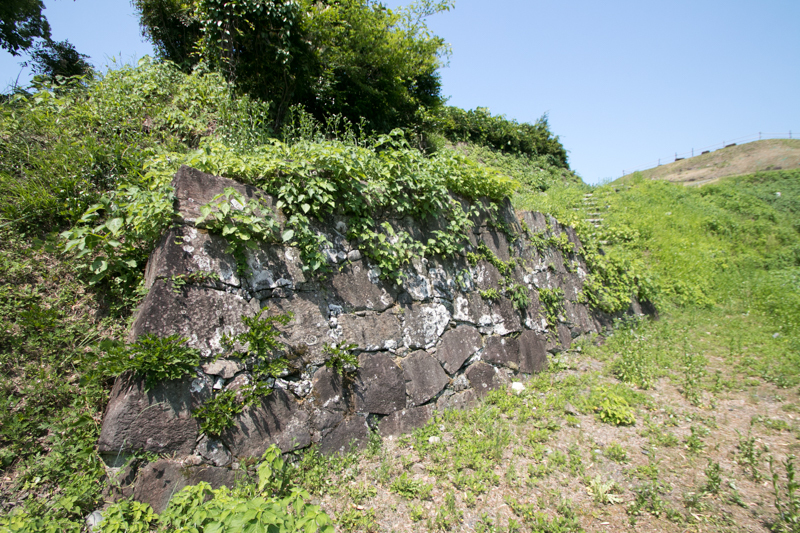 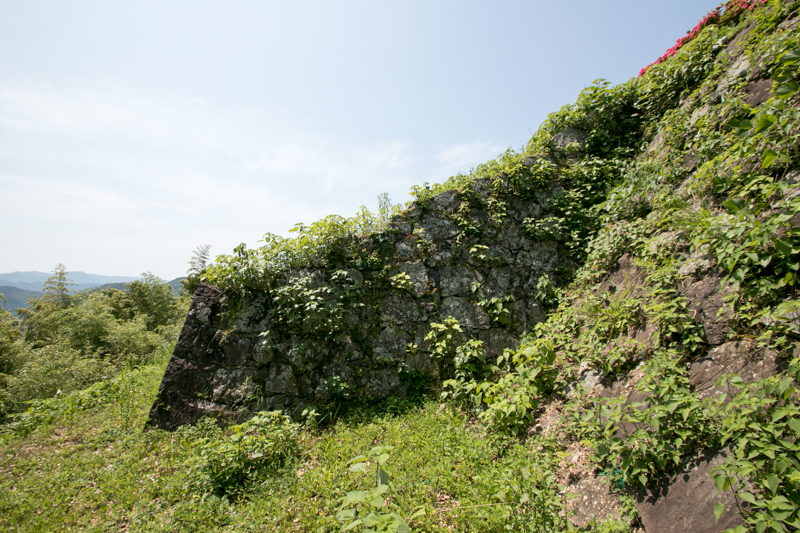 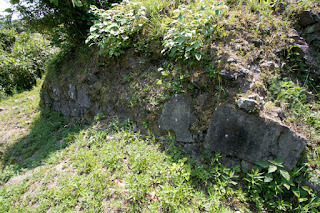 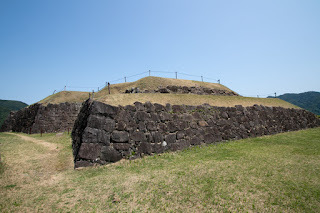 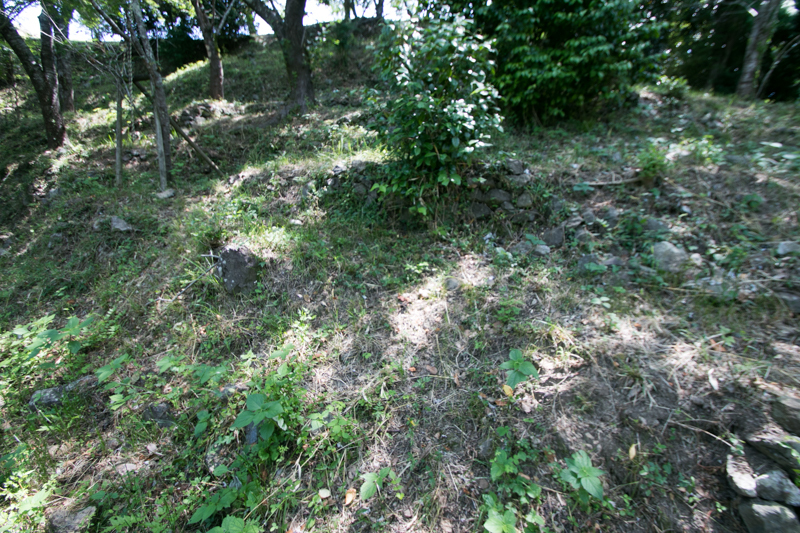 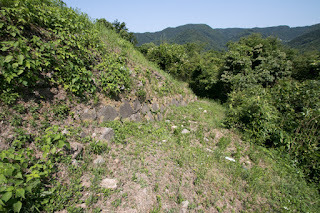 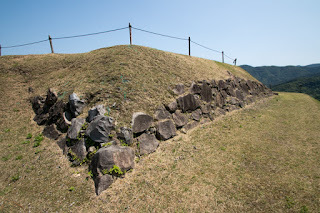 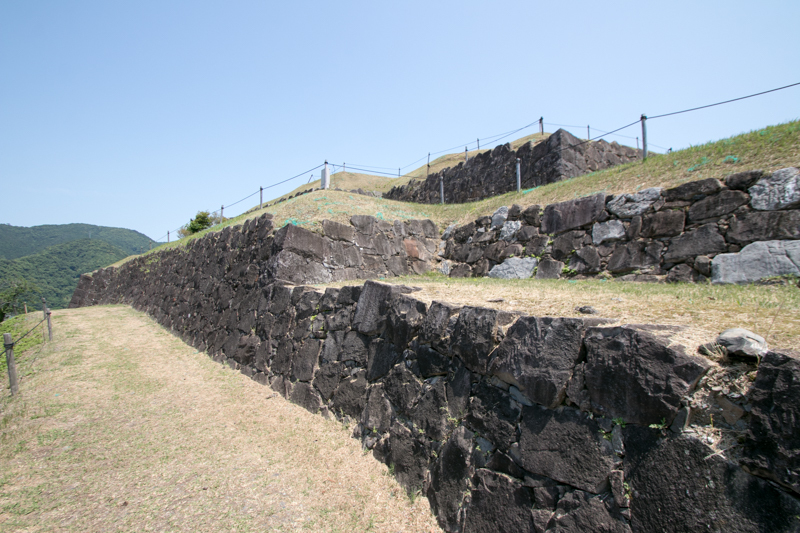 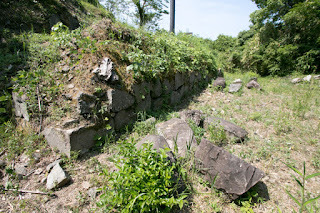 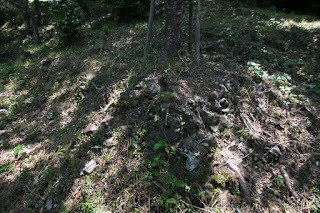 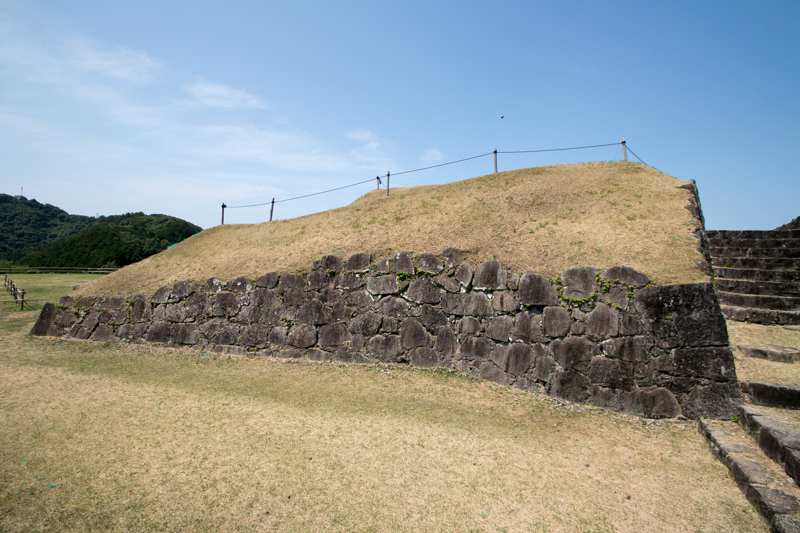 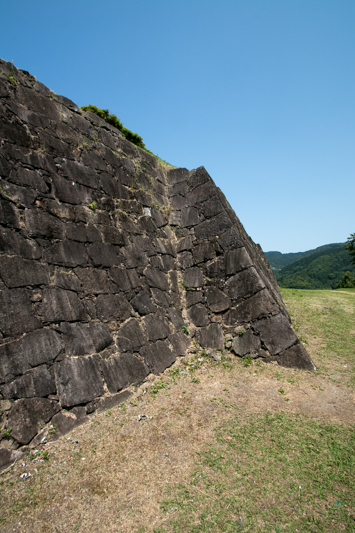 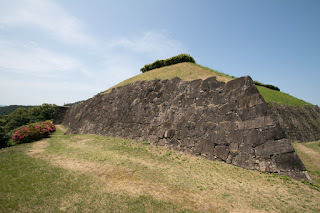 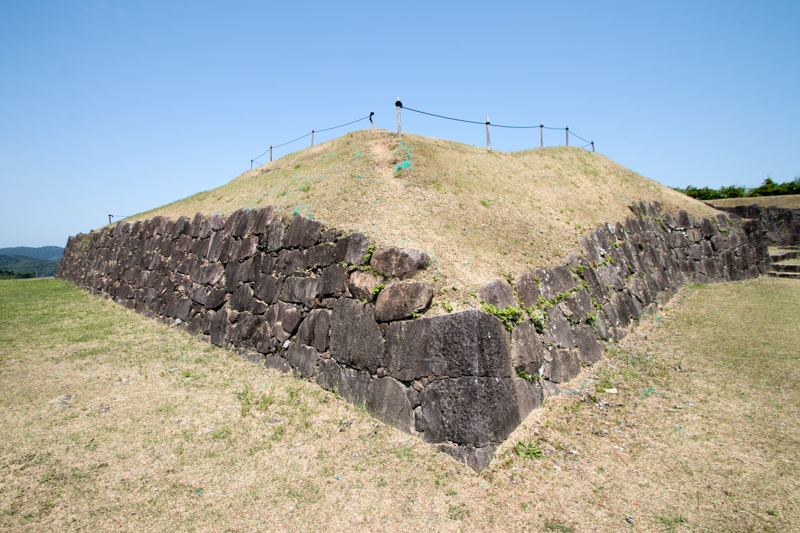 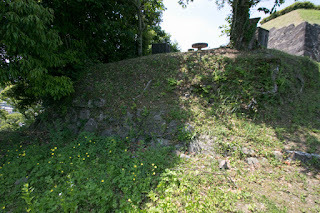 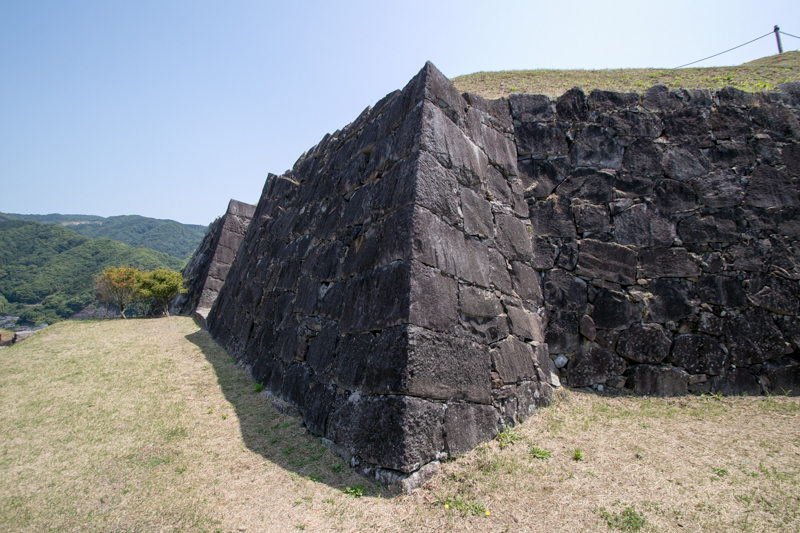 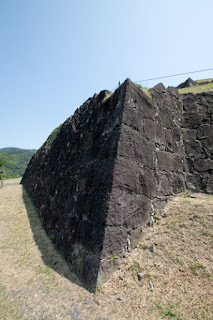 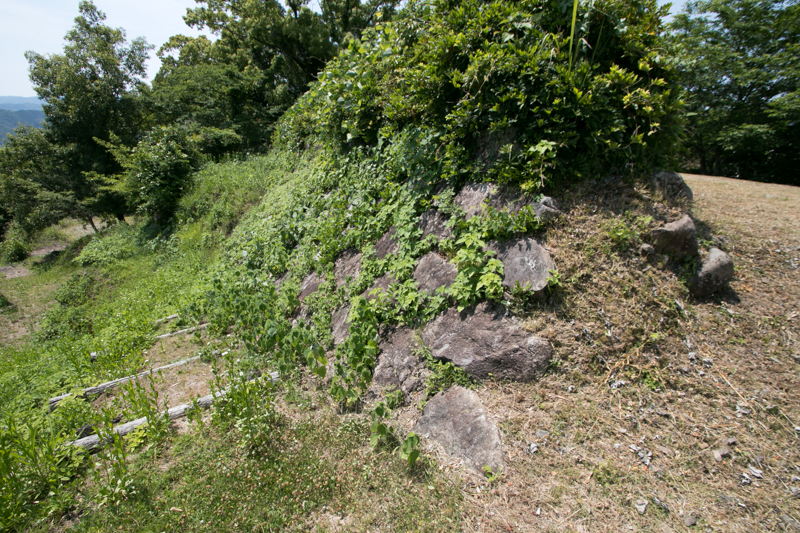 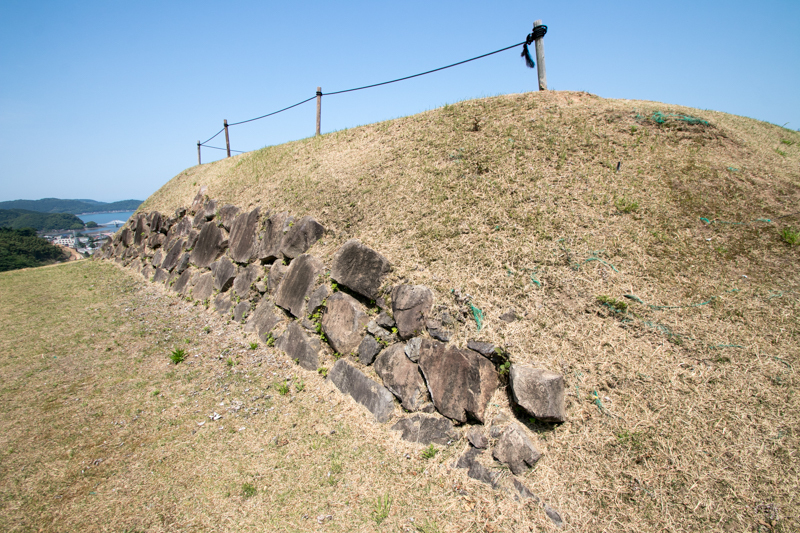 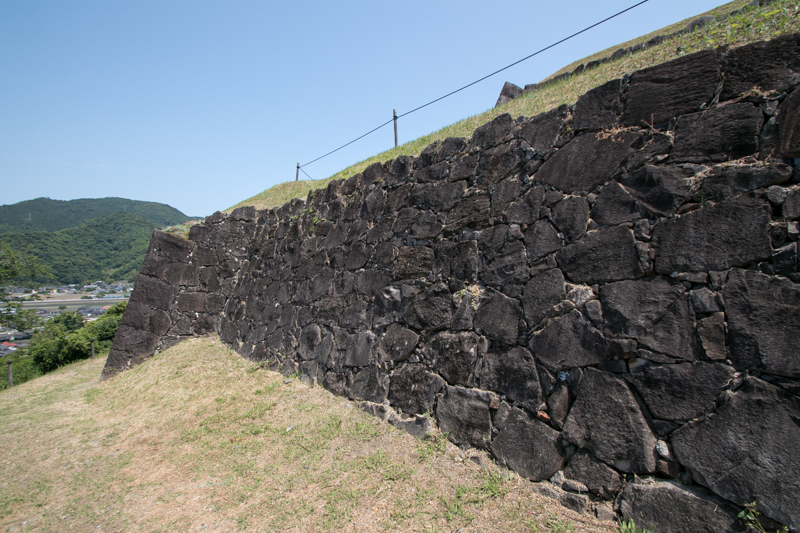 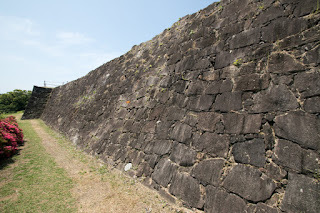 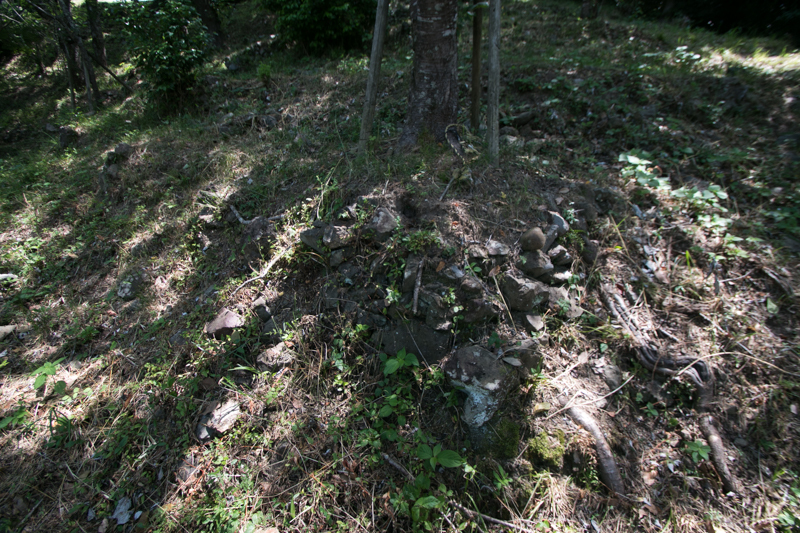 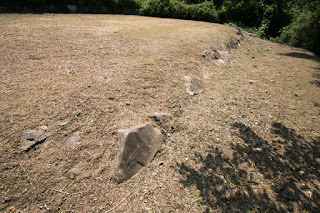 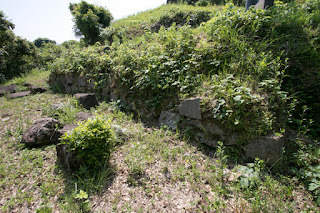 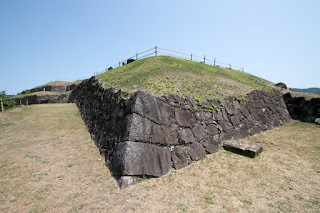 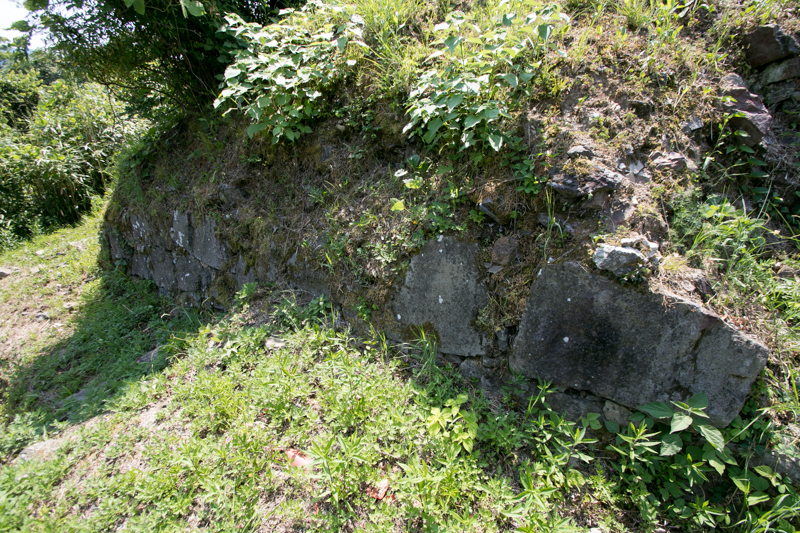 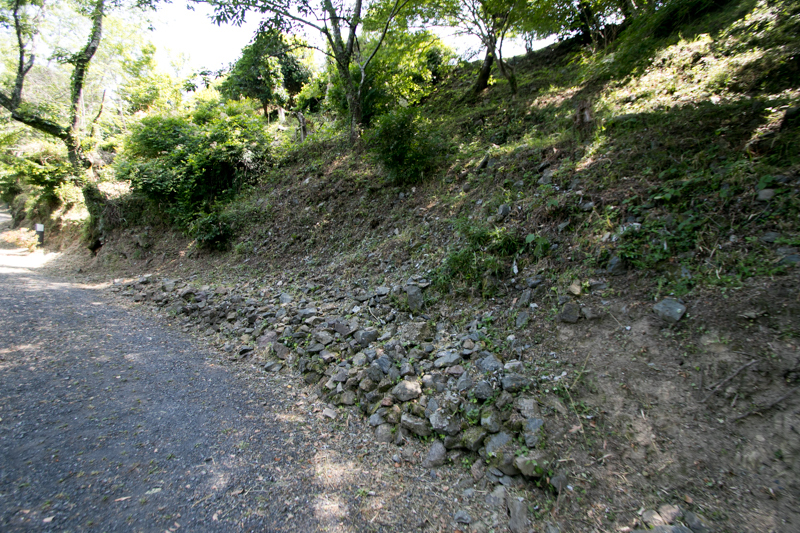 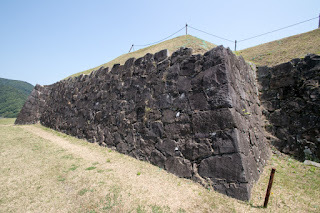 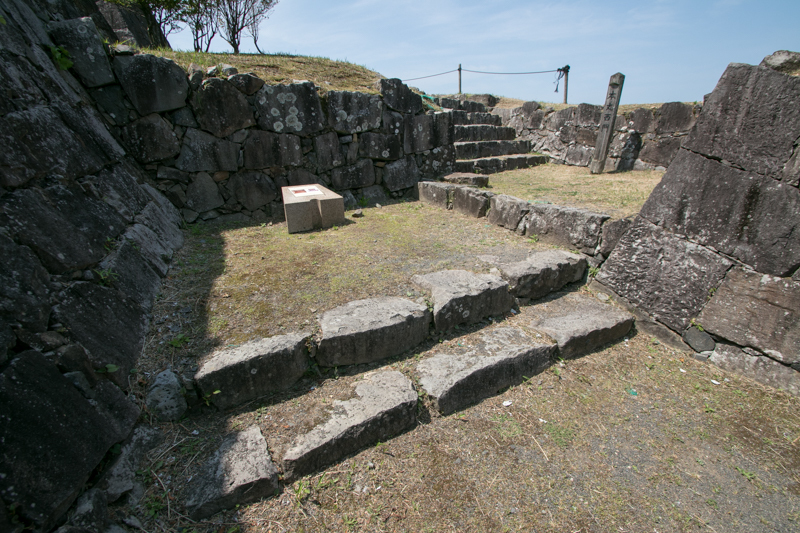 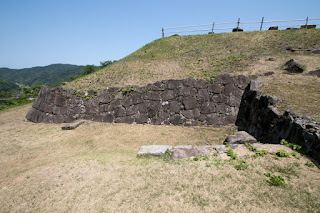 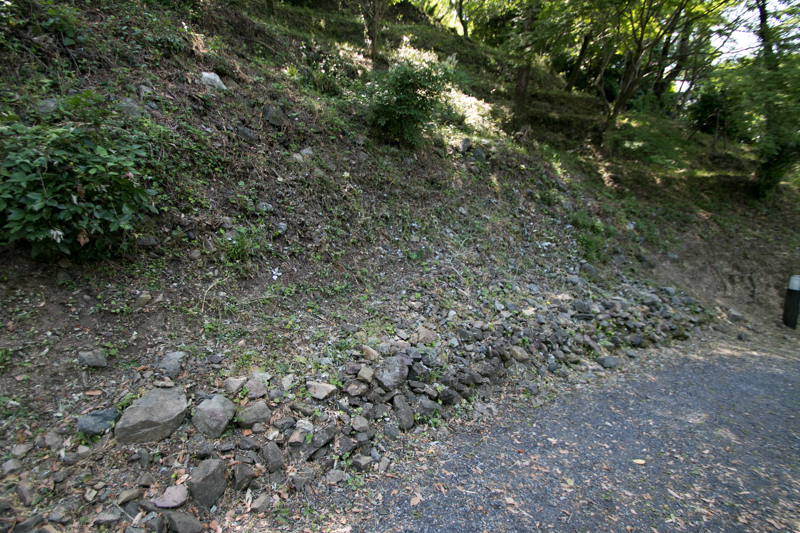 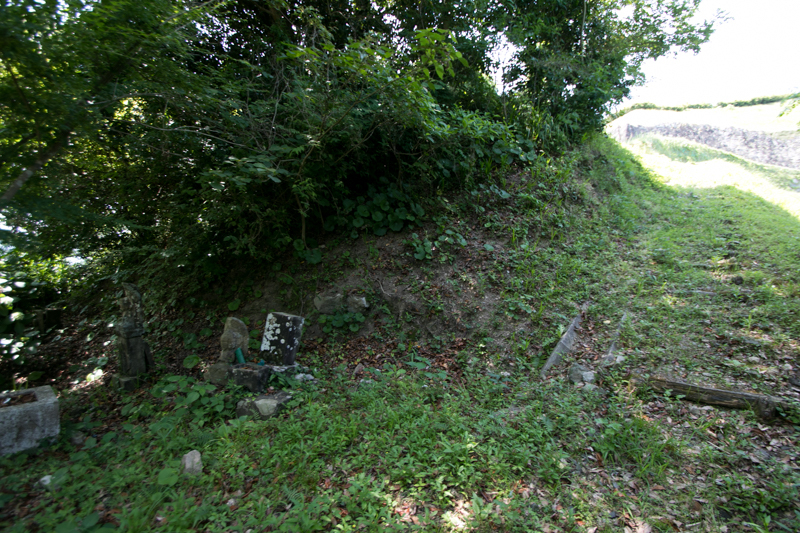 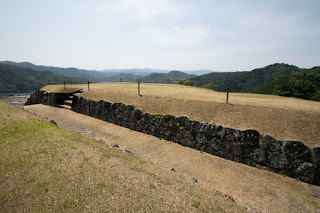 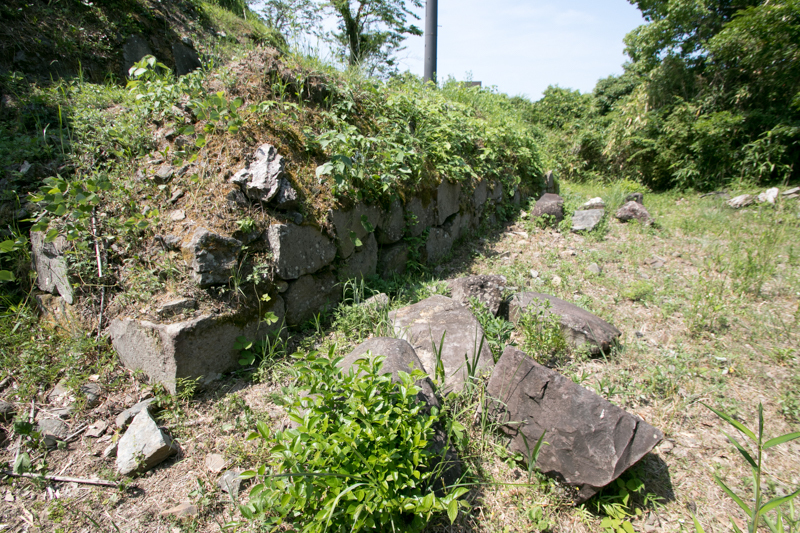 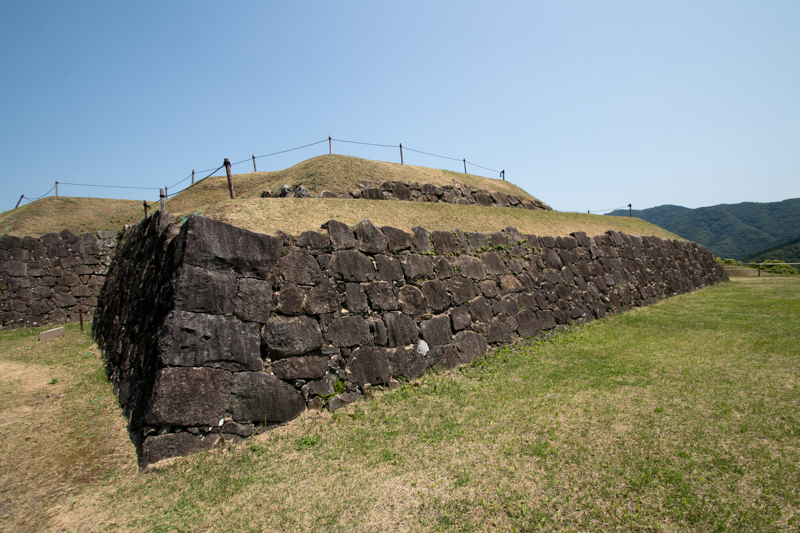 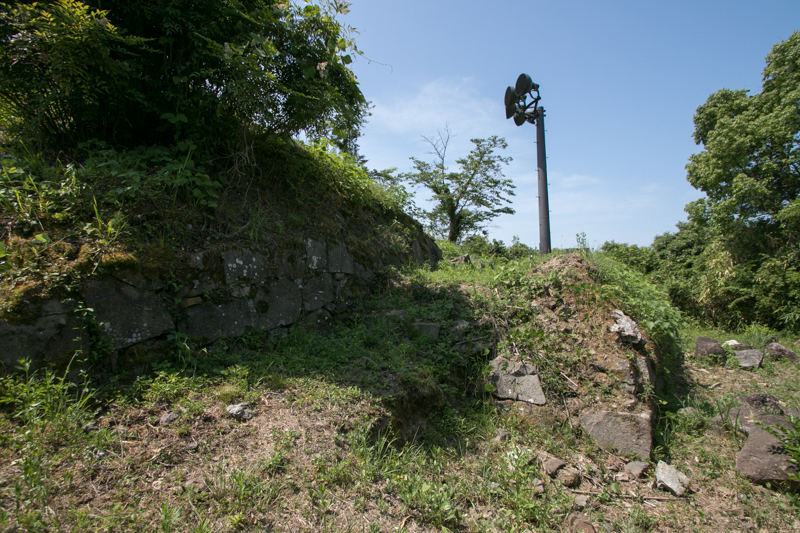 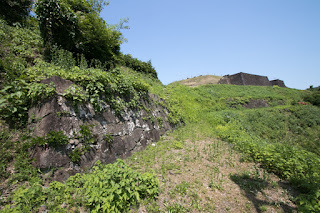 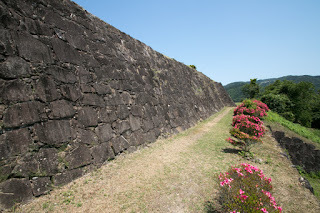 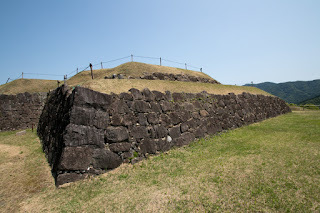 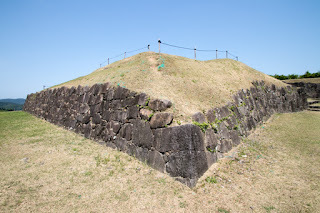 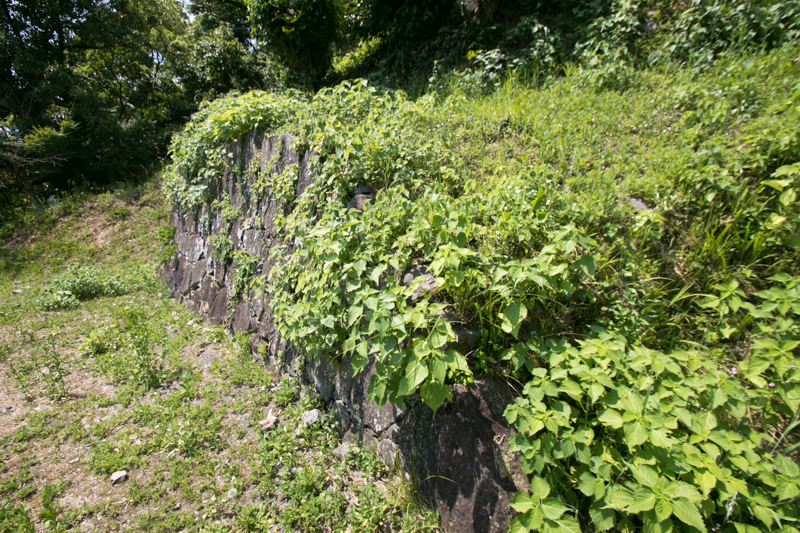 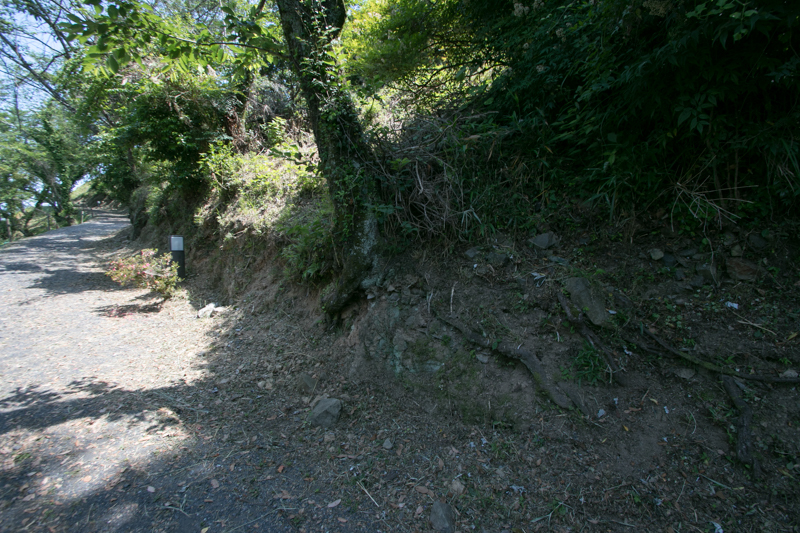 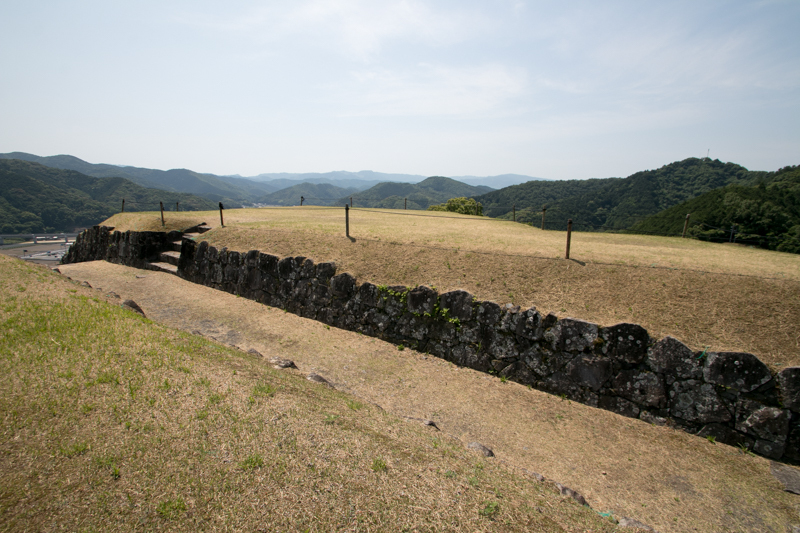 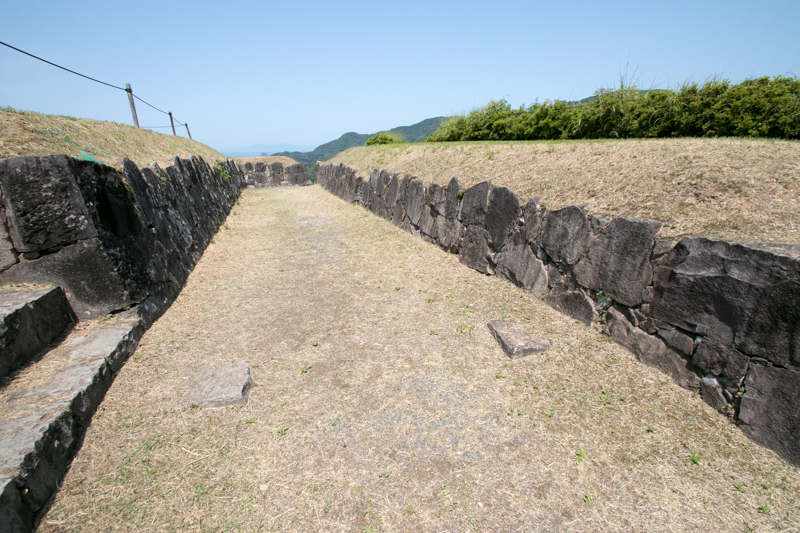 Both edge of this stone wall had a turret base, and two turrets might be connected by Tamon turret (corridor barrack). 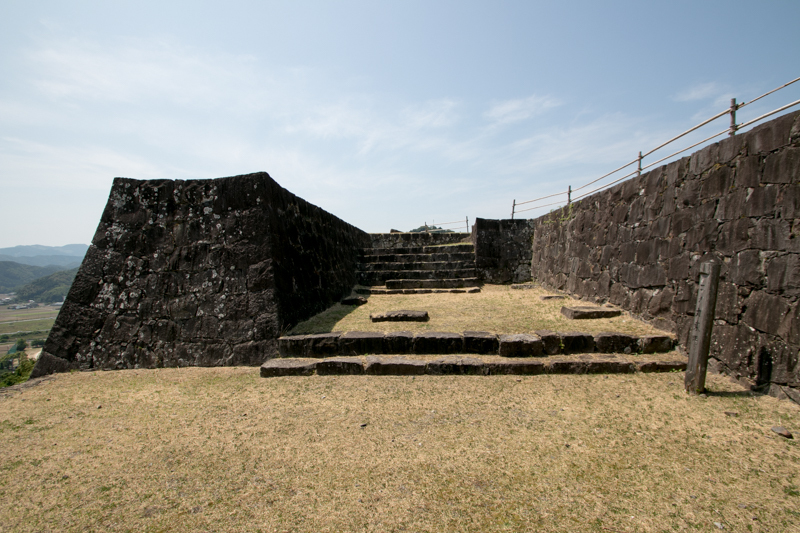 Furthermore, a magnificent front gate guarded by tall stone walls and guarding turrets was built at the below of former front gate. 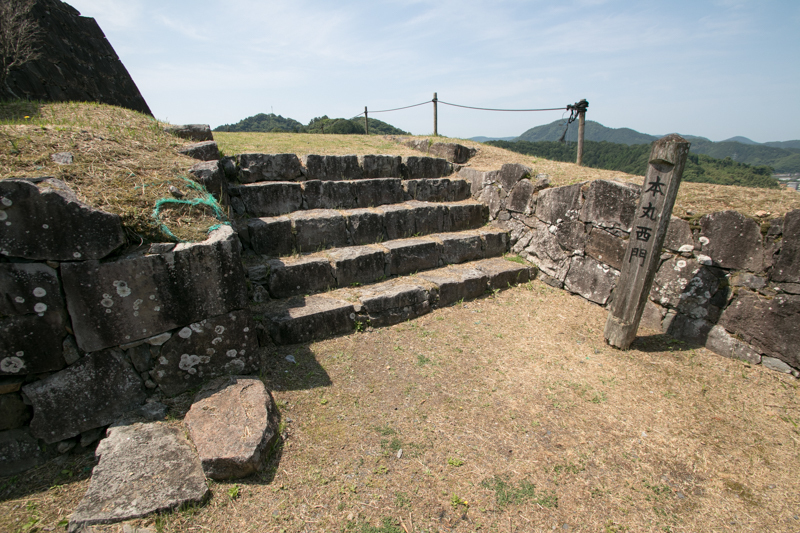 Different from other gates this front gate has a broad step turning 90 degree, and former front gate into secondary area was also renovated into the same shape. 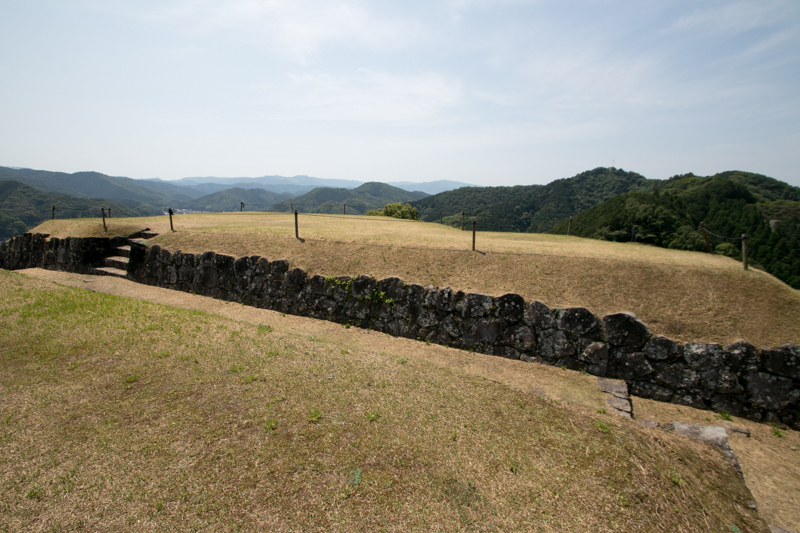 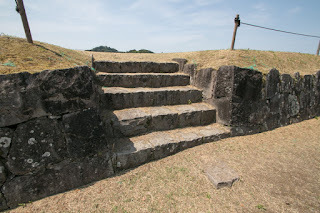 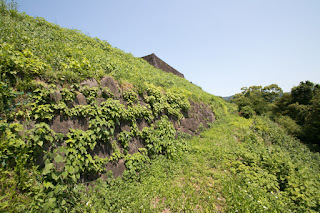 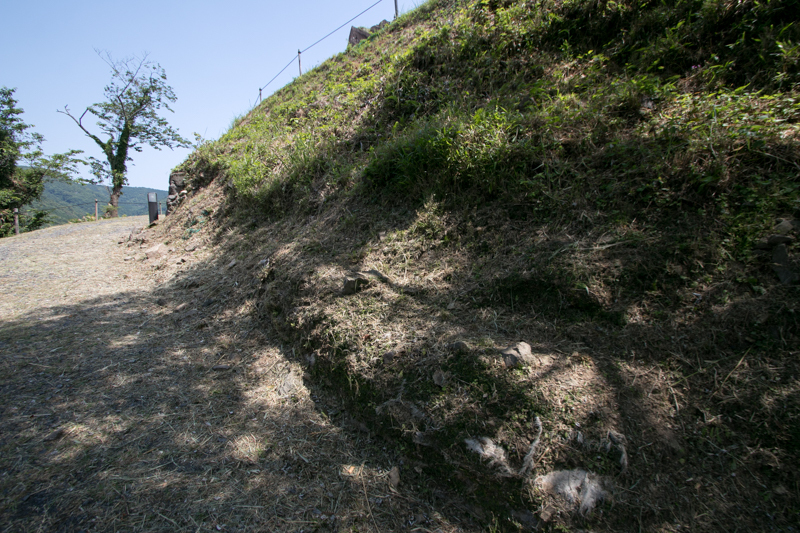 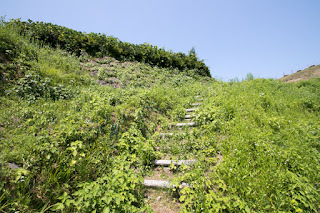 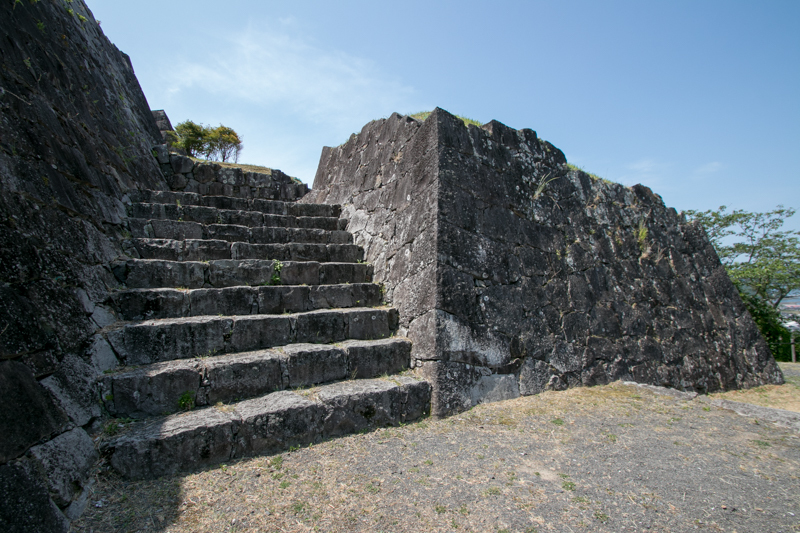 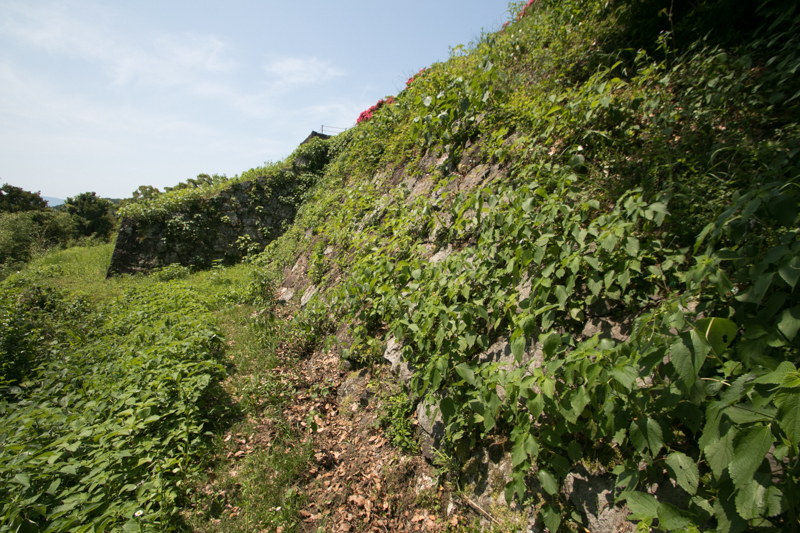 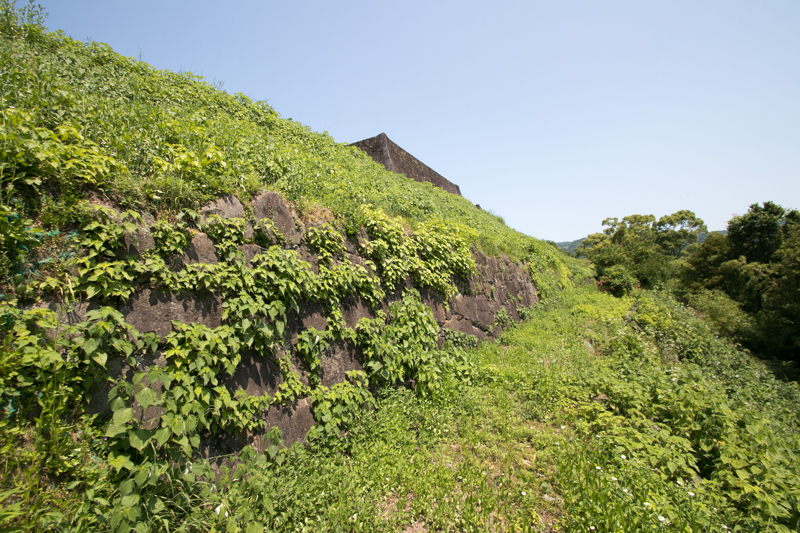 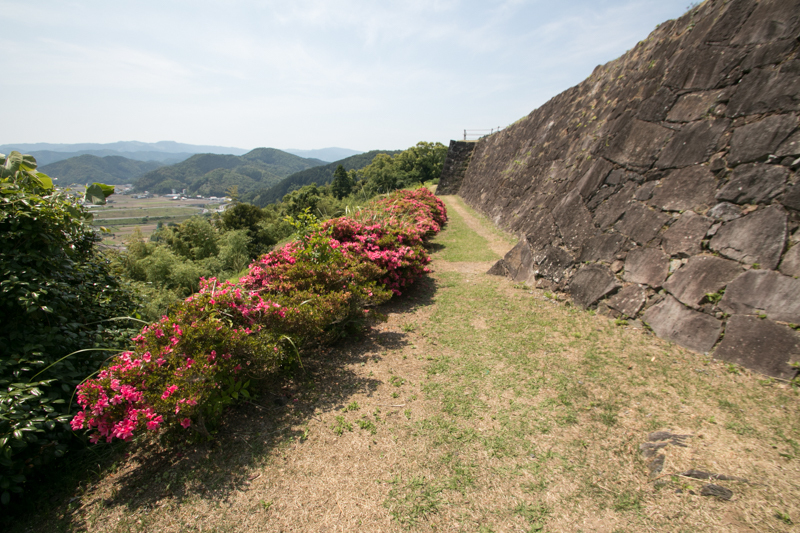 Even though a small castle of 100 meter long and 50 meter wide, Sashiki castle fully protected stone walls on the mountain had a strong dignity for people and Shimazu clan. 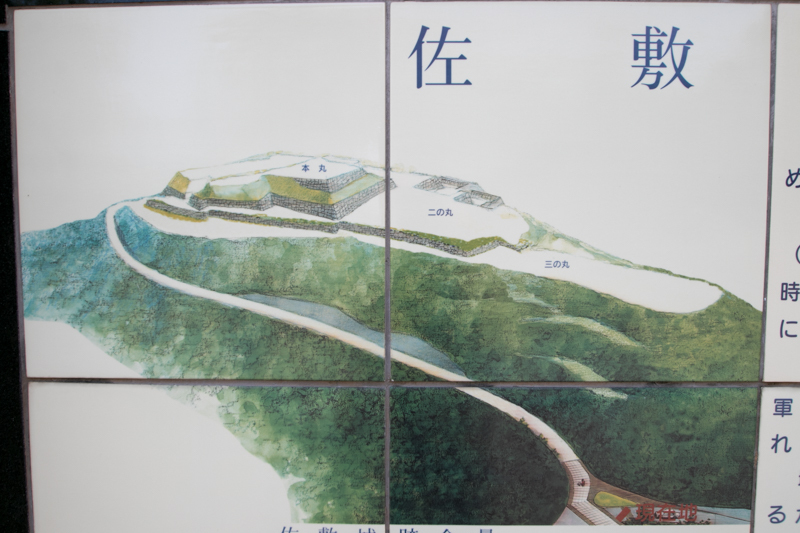 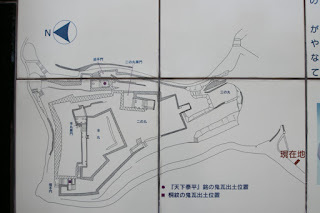 But in 1615, based on the establishment of Ikkoku Ichijyo Rei (one castle one domain rule), Sashiki castle was abolished and buildings were broken. 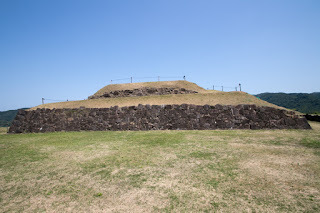 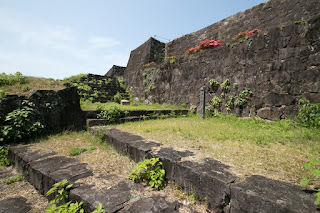 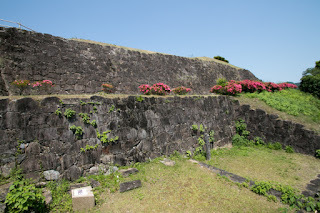 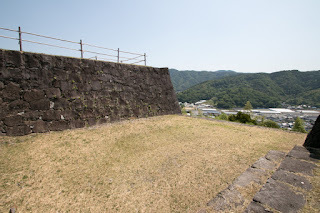 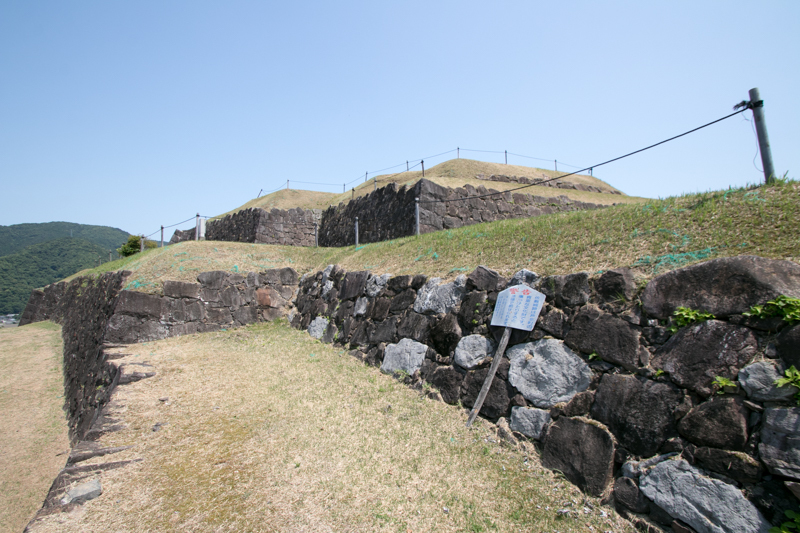 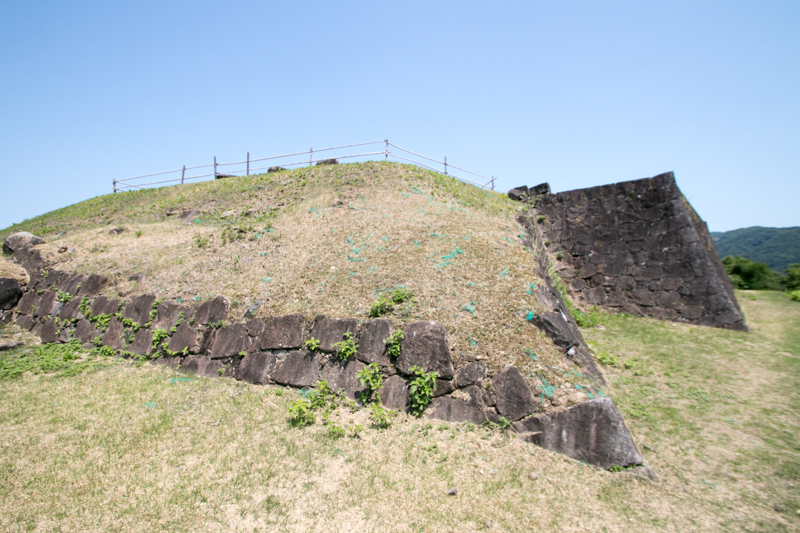 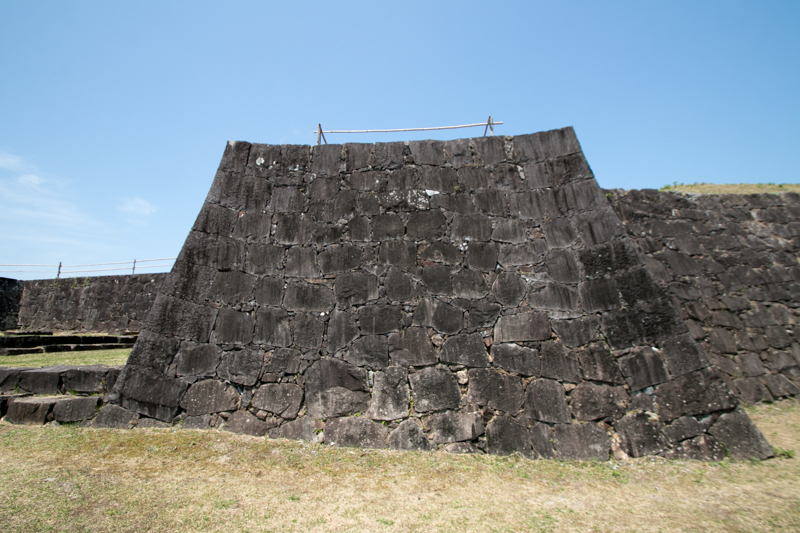 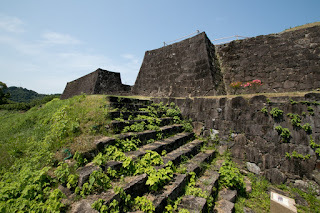 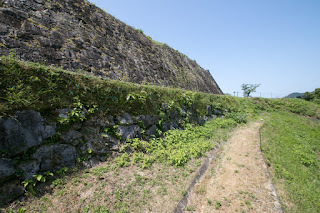 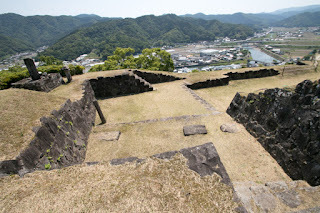 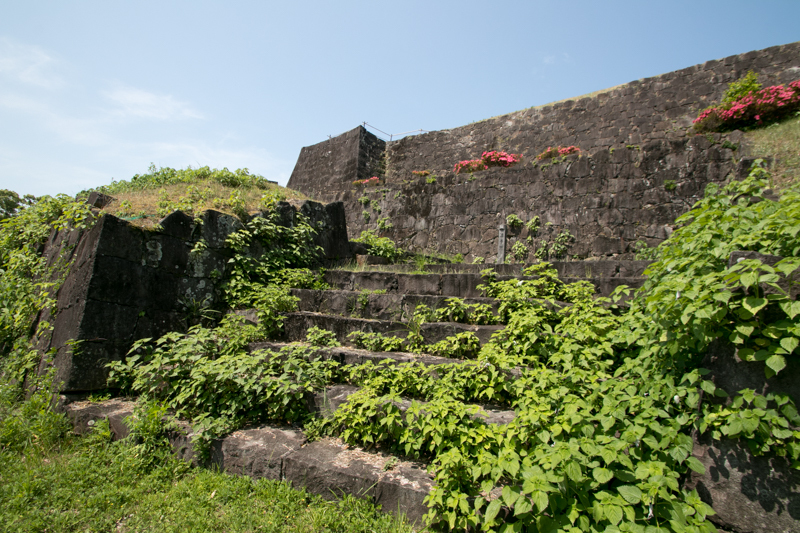 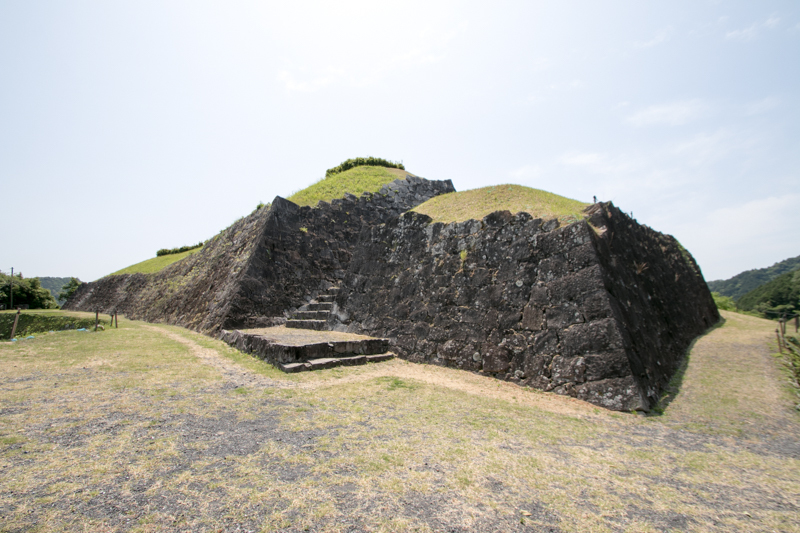 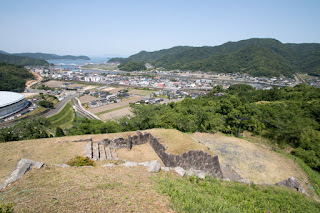 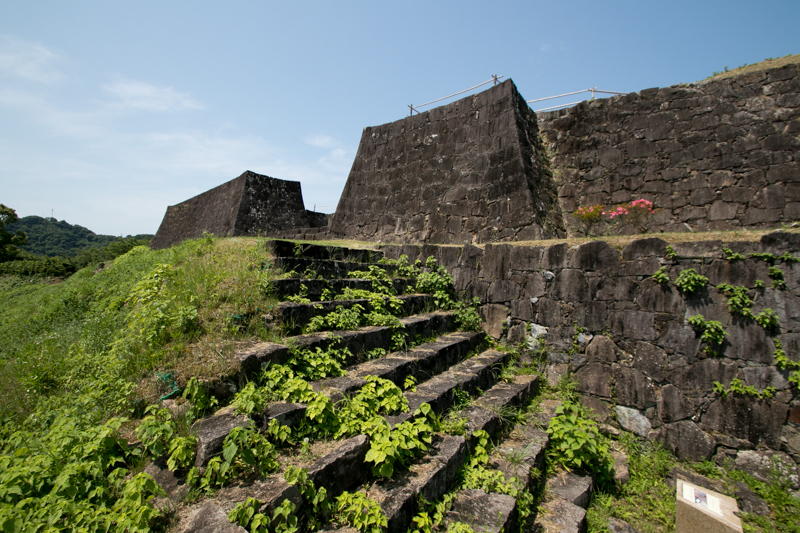 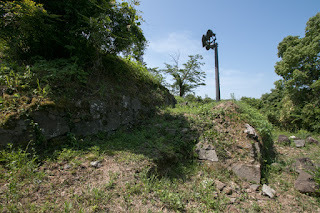 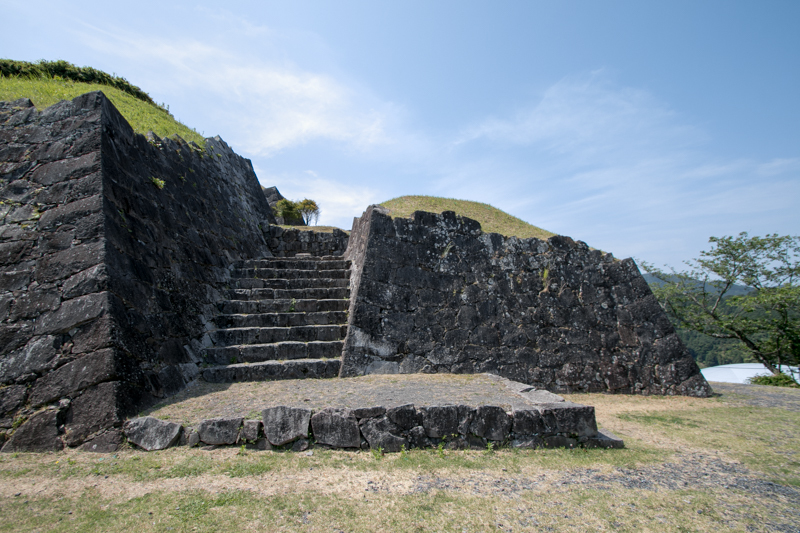 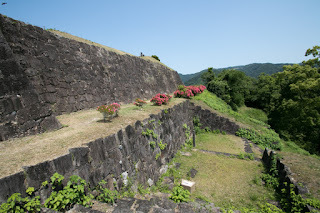 Furthermore, after the cease of the rebellion of Shimabara occurred at abolished site of Hara castle (Nagasaki prefecture), Edo Shogunate ordered to break Sashiki castle thoroughly, as it was close to Amakusa island which was another base of rebellion. 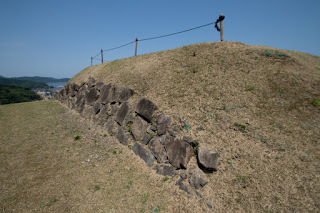 Upper half of stone walls were broken, and gate was filled by stones and sands. 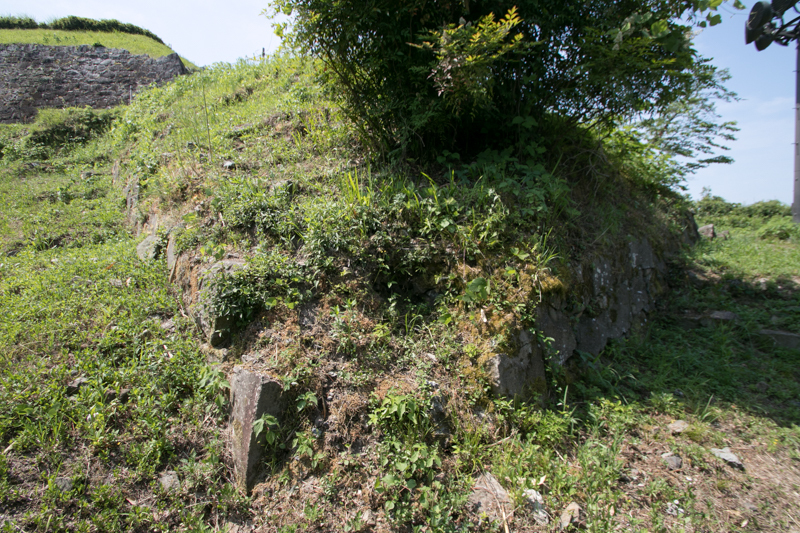 Interestingly two large decorating roofing brocks were filled at site of two gates, and it might be intended to seal the castle symbolically. 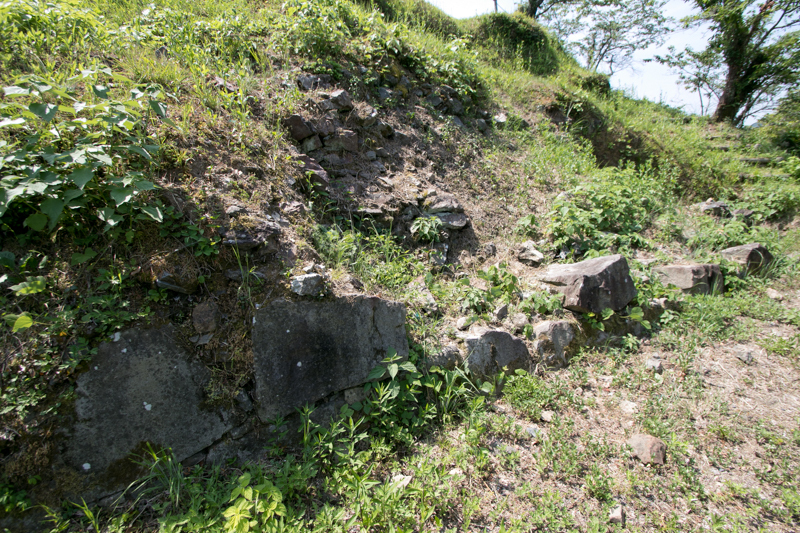 Ruin of castle became devastated, but recently the ruin of stone walls was found and castle site was investigated. Based on the historical study, stone walls of the castle was restored for the shape just after destruction. As a genuine border castle, Sashiki castle might a masterpiece only compared to Kamei castle (Hiroshima prefecture), which was built by Masanori Fukushima (1561-1624), the colleague of Kiyomasa Kato. 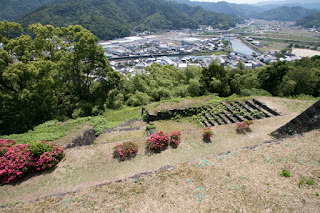 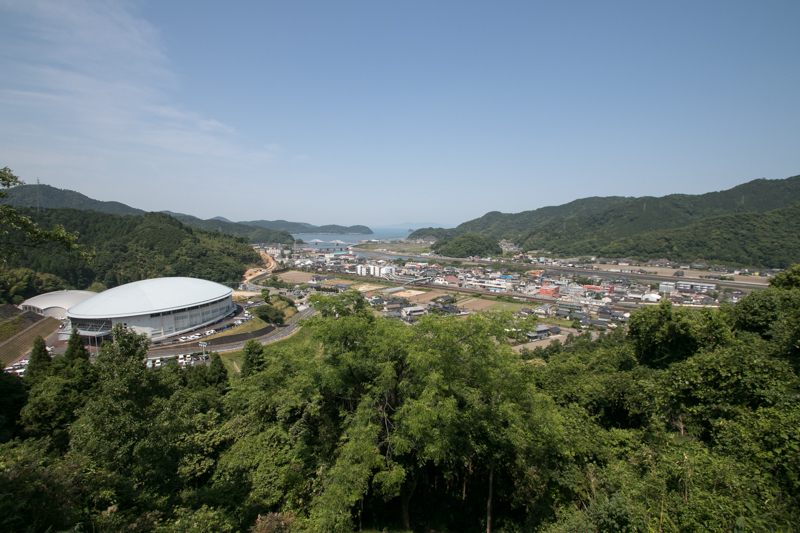 From castle site Ariake ocean and valley road toward Hitoyoshi area is well seen, and this shows the geographical importance of the castle well. 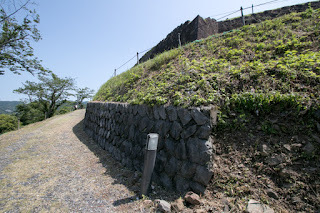 Also secure front gate and technically built stone walls expresses continuous military tension between Kato clan and Shimazu clan at the border. 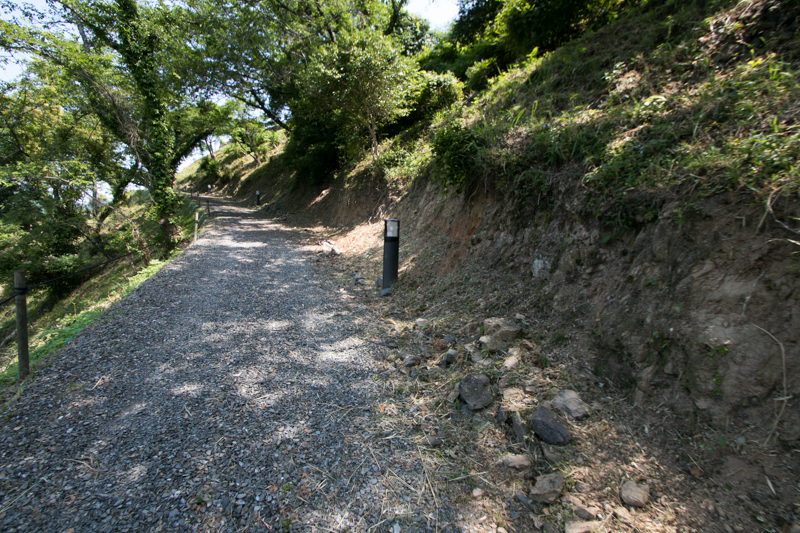 20 minutes walk from Hisatsu-Orange line Sashiki station. 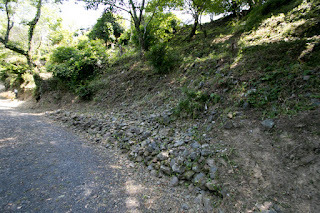 10 minutes drive from Minami-Kyushu-Nishimawari Jidoshado Ashikita interchange.